There are currently 91,344 users on this website. hello everyone. I have wanted to do this for a while because the split planchet is one of my favourite errors. The split planchet isn't discussed often and they don't seem to get very much attention. they are also scarce on eBay but often ignored. so today I will put a spotlight on this unique error and share what I have learned. One of the reasons I favour the split planchet is the wide variations in weight, shape, look, and strike. 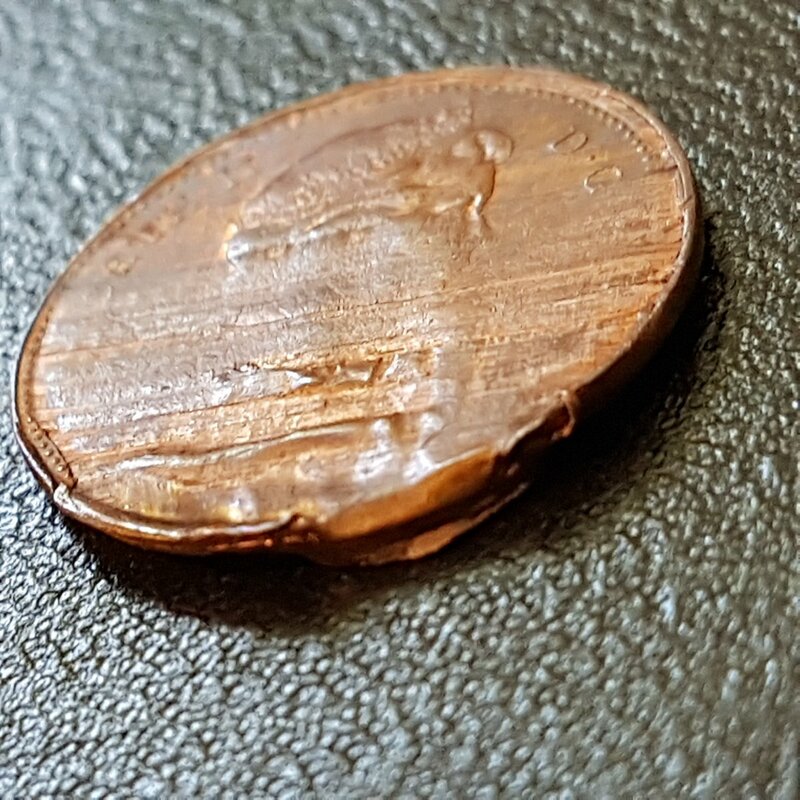 The weight of a split could vary from 25% to 75% of the normal weight of a planchet but most fall within the 40% to 60% range. 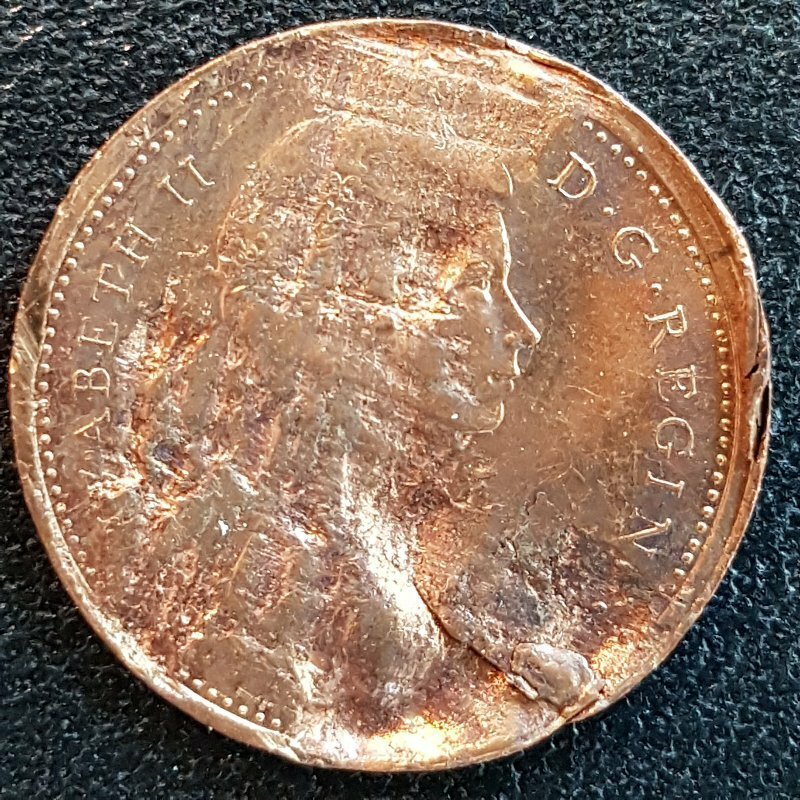 This variance in weight affects the shape and strike of each coin differently, creating an interesting variety of coins in one error type. Split planchets also cause mischief with other coins causing brockages, partial blockages, die caps, and jams in the feeding equipment. They also cause problems with counting machines once they leave the mint. I think of the damage as part of the nature of split planchets so therefore they are an acceptable part of the coin's features. 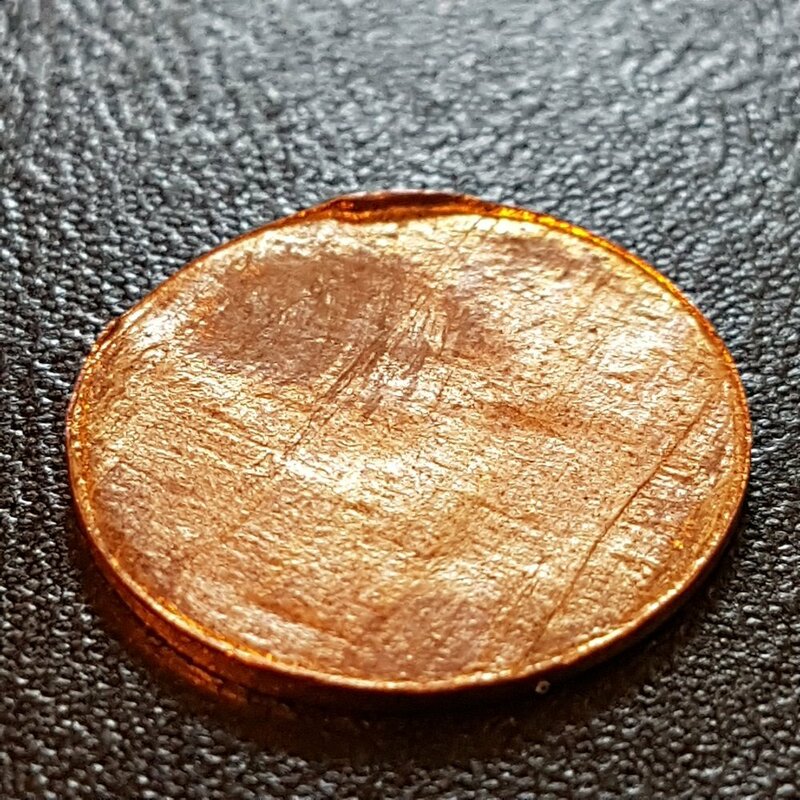 Split planchets occur when impurities trapped in the metal causing the planchet to split apart. 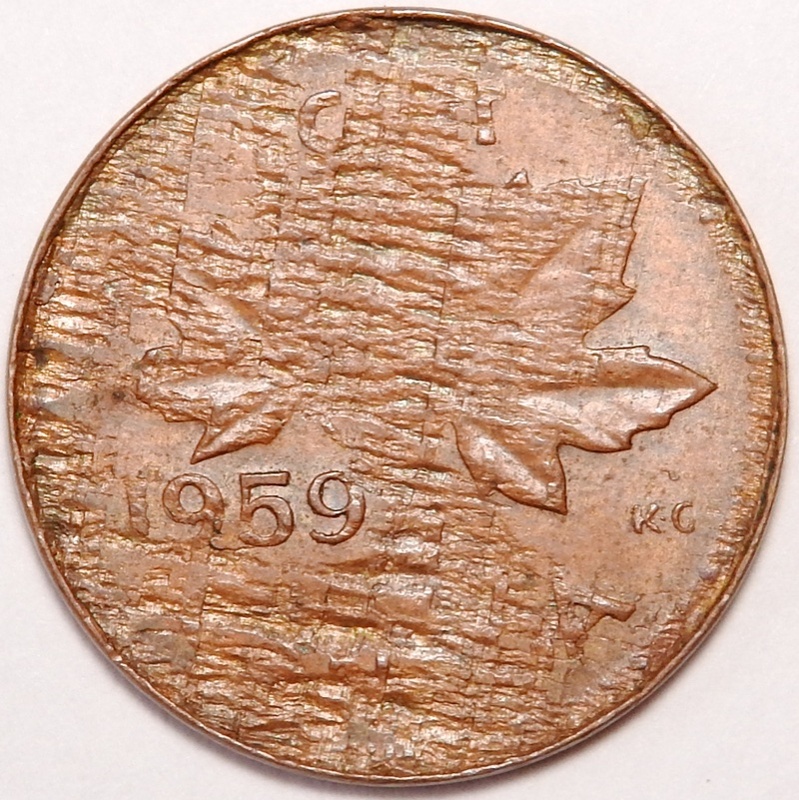 a split planchet is essentially a lamination error. this split may occur before or after the planchet is struck and this creates 2 distinct categories of split planchets, 'split before strike' and 'split after strike'. 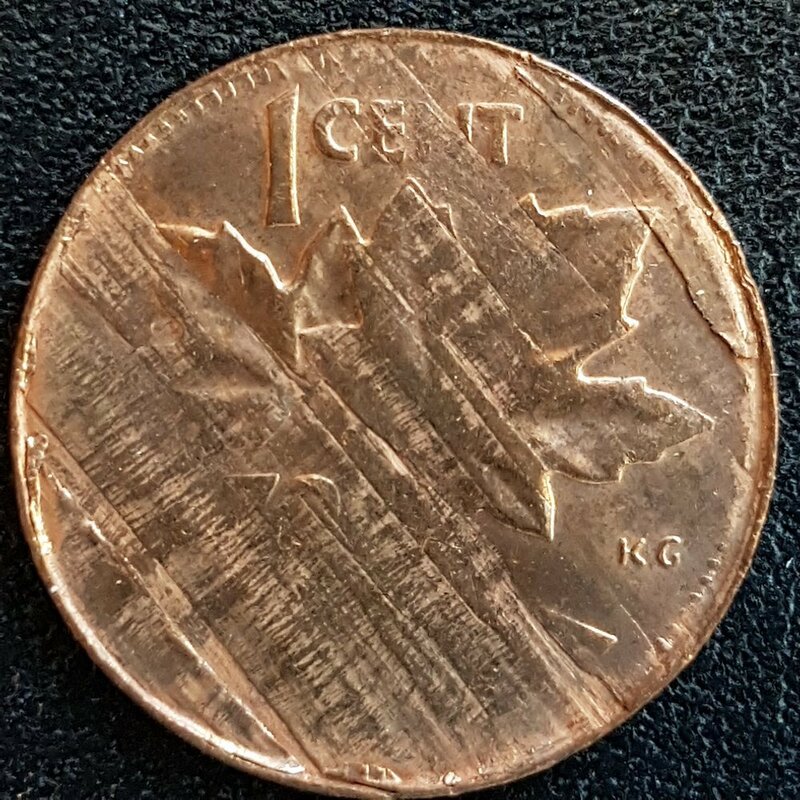 My collection contains 17 various Canadian 1 cent split planchets, 12 are split before strike, 4 are split after strike (or are they! 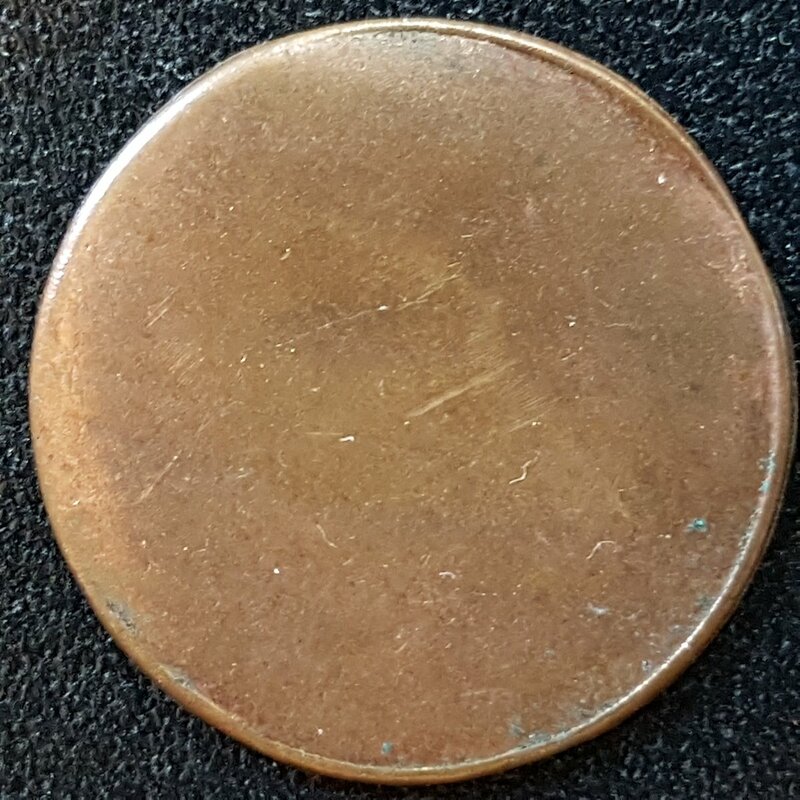 ), and 1 blank split planchet (which could technically be any similar copper planchet from any country but since I purchased it in Canada we will assume it is Canadian). I will also present a partial split planchet and a retained partial split planchet (clamshell). 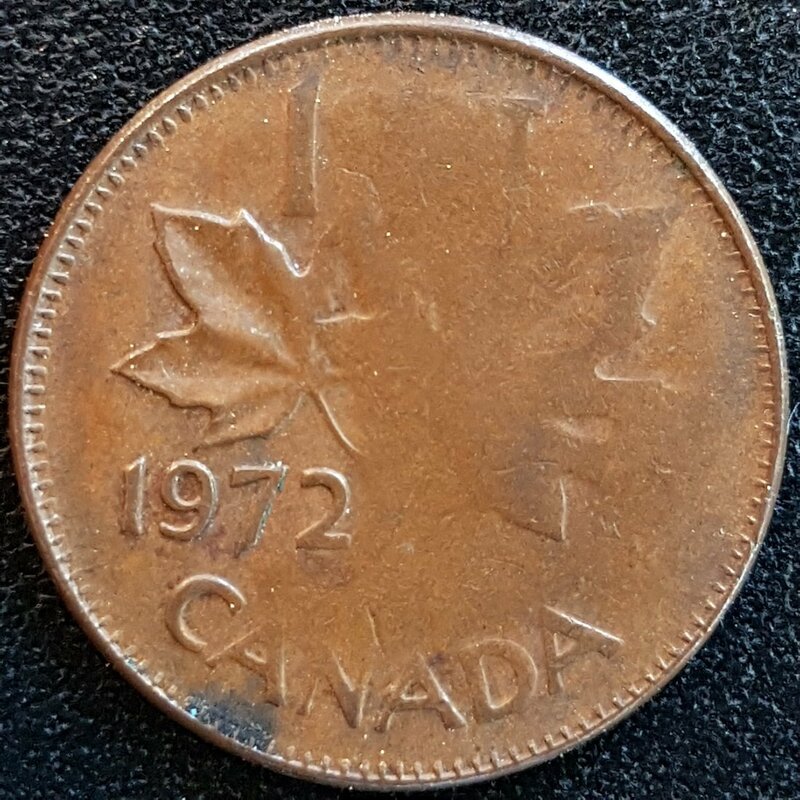 coin # 1 is from 1975 and weighs 1.68 gr which is 52% of the weight of a typical 1973 1 cent. note that the strike is weak especially around the lettering but is stronger in the middle and at the date. note the major scratch on the reverse right through the date and the gouged edge. 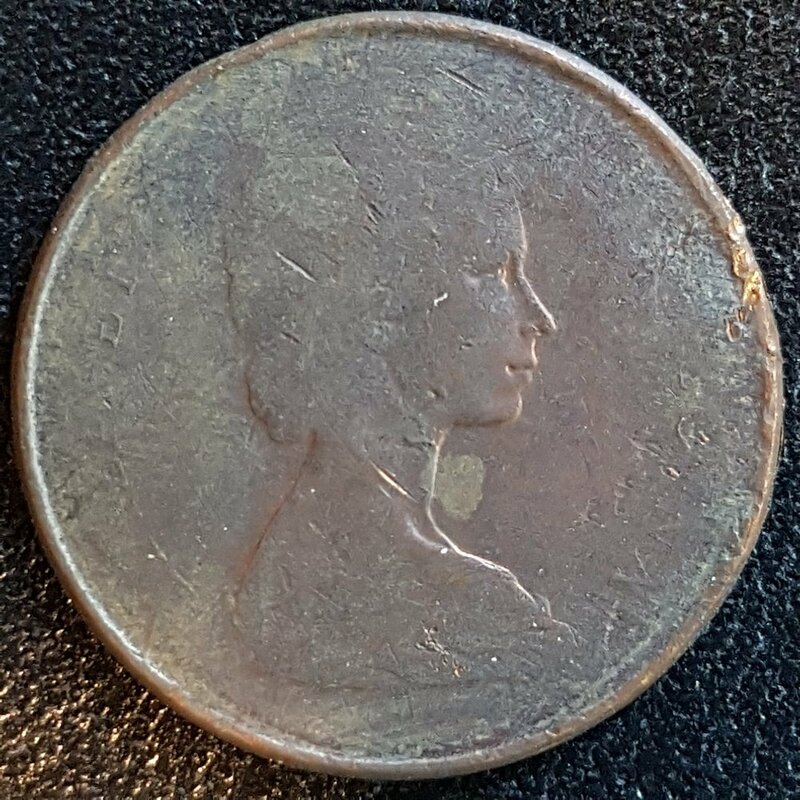 coin # 2 is from the 1970's and weighs 1.83 gr which is 56% of the weight of a typical 1970's 1 cent. 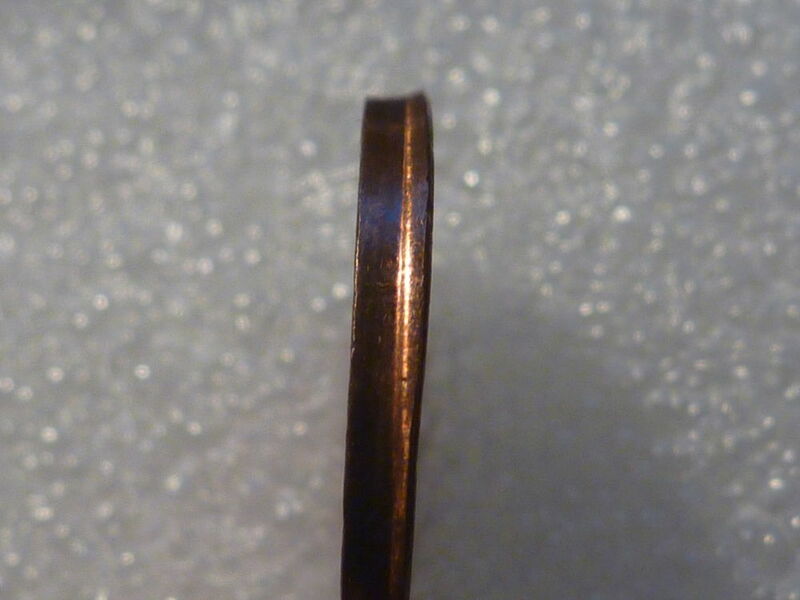 this split is thin at the top and bottom and through the middle but is a normal thickness on the sides creating strong strikes where there was enough metal. this coin really shows how haphazard a split can be! 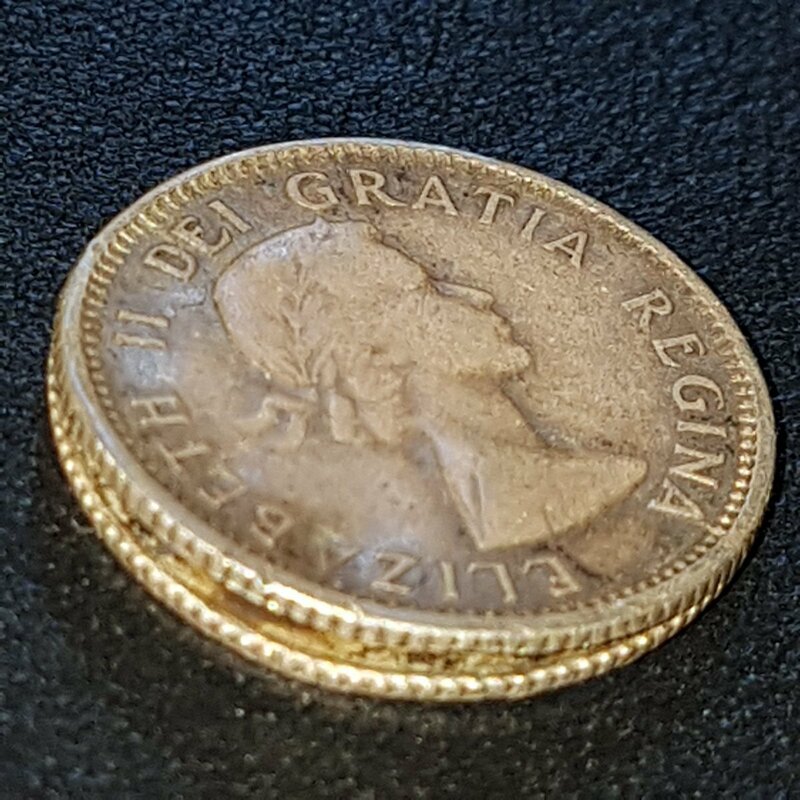 coin # 3 is from 1972 and weighs 2.18 gr which is 67% of the weight of a typical 1972 1 cent. 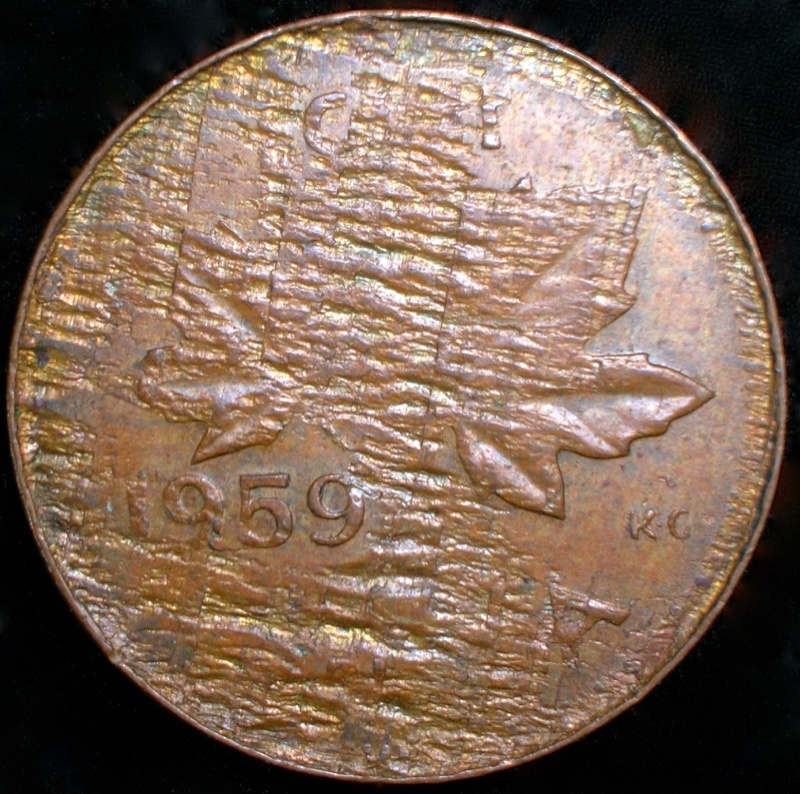 with a larger percentage of the original planchet present, the strike is not as weak as other split planchet strikes. 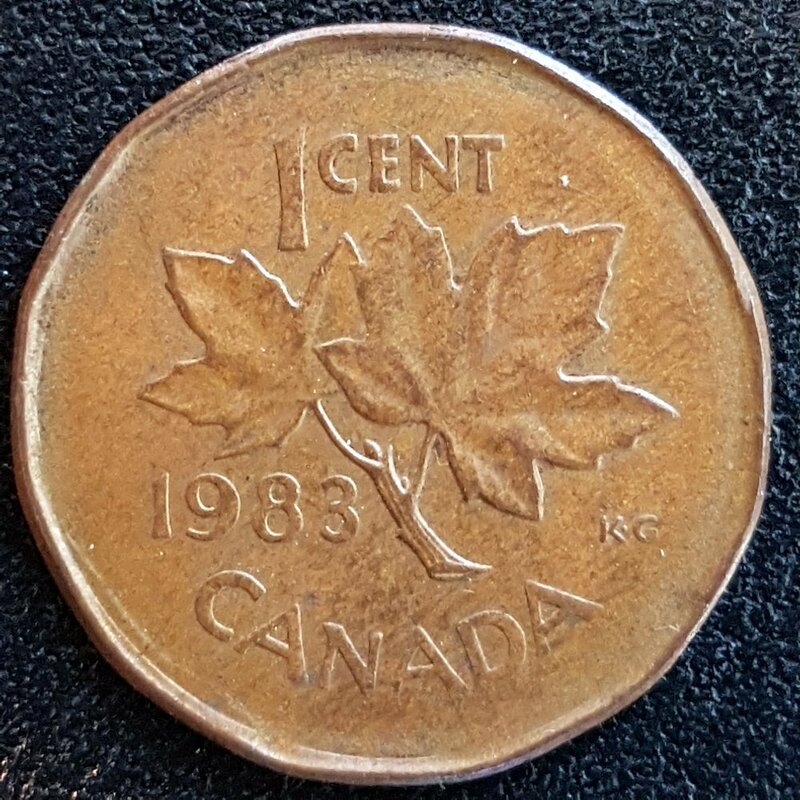 coin # 4 is from 1983 and weighs 1.26 gr which is 50% of the weight of a typical 1983 1 cent. I am surprised at the strength of the strike on the reverse other than the missing beads, queen's back, and weak rim. also note the striations from the rolled impurities in the copper strip. this could have been the catalyst for the split. 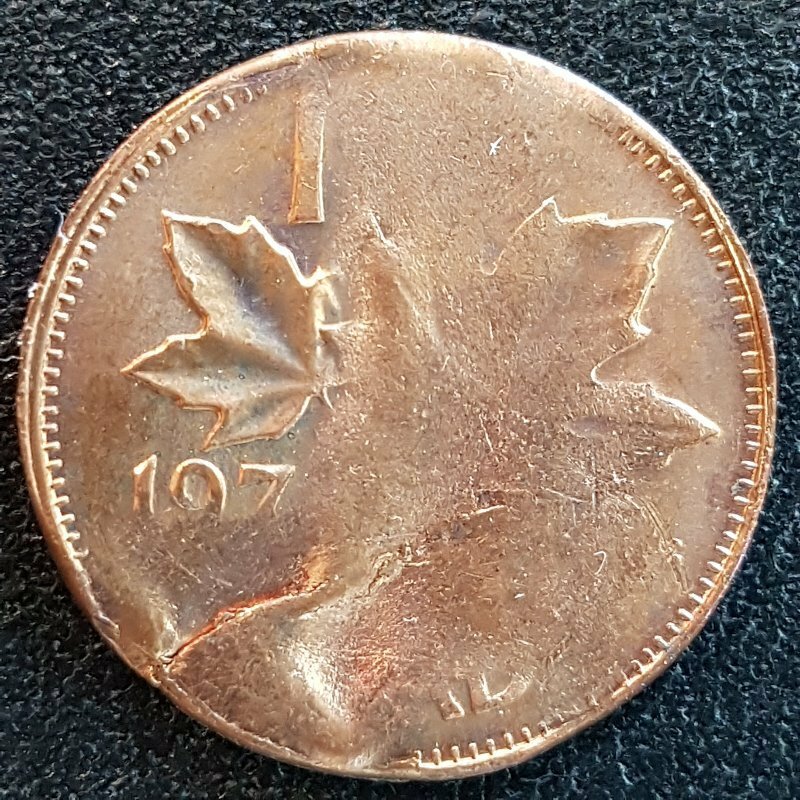 coin # 5 is from 1965 to 1978 and weighs 1.57 gr which is 48% of the weight of a typical 1965-78 1 cent. no matter what angle I look at the date area, there is no way to determine what it is. there is no ghosting or weak strike at all. I can only be sure of the date range from the bust. so this one is interesting with the larger percentage of the metal at the top. 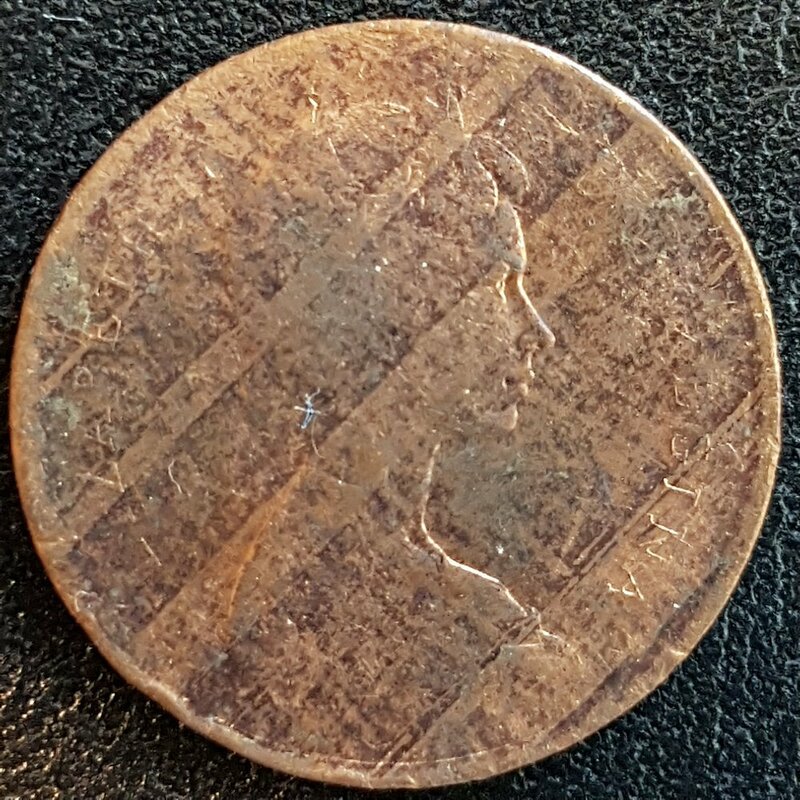 there is virtually no strike on the bottom half of the coin except for the small area of the lower bust where there are striations. 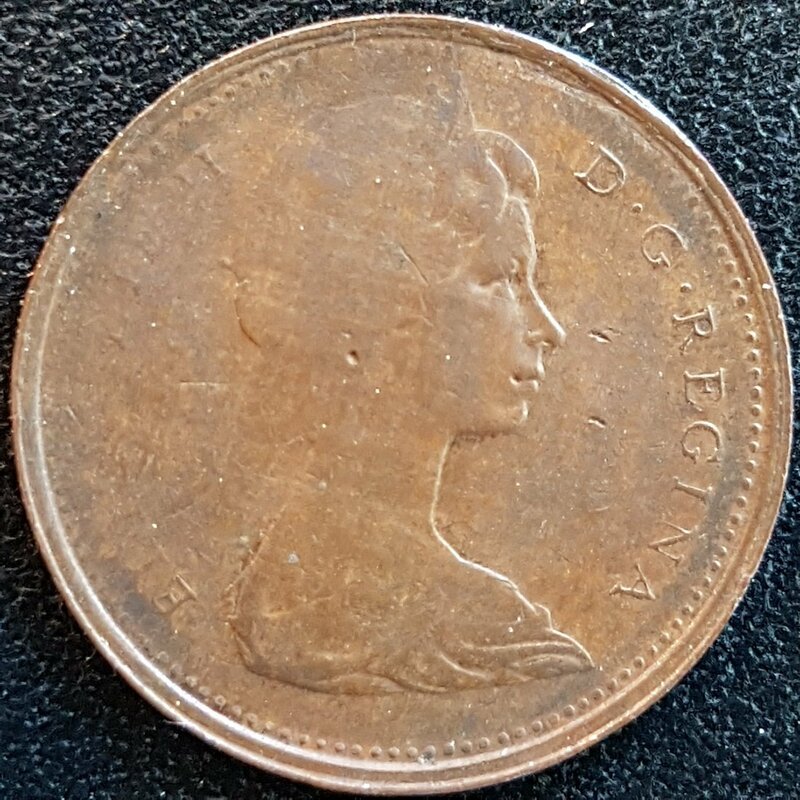 the other item of note is the area around 5 o'clock on the obverse where the coin is pushed down and on the reverse in the same place there is a rim fin. it looks similar to a coin with a 99% off center strike but I can't confirm that because there isn't any strike elements to prove it. I don't know if the rim fin proves anything so I would like your opinions please. 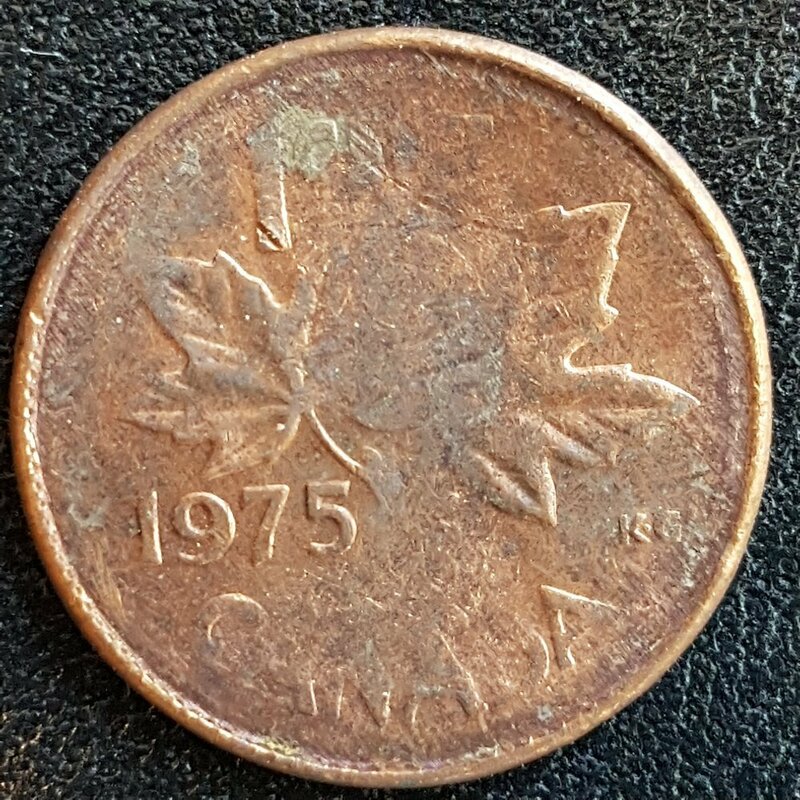 coin # 6 is from 1975 and weighs 1.49 gr which is 46% of the weight of a typical 1975 1 cent. this coin has nice large striations showing an improperly mixed alloy. only the date has a strong strike. 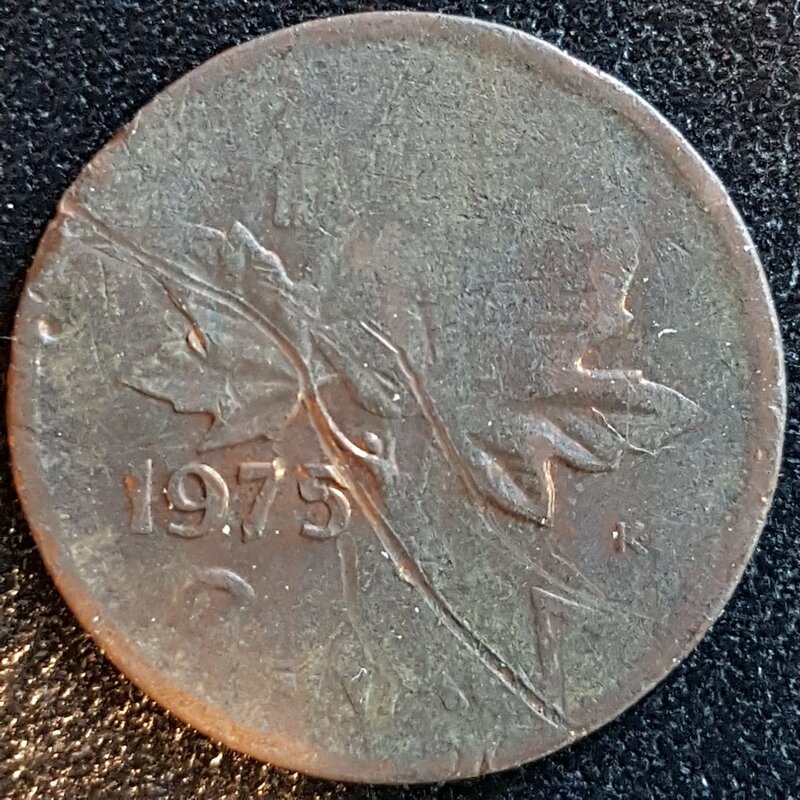 coin # 7 is from 1972 (I think) and weighs 1.58 gr which is 49% of the weight of a typical 1972 1 cent. according to my 2x2, this is a 1972 so when I slabbed it I was pretty certain that the date was 1972. as I look at the other possibilities, I can't be so certain anymore. lol. any thoughts on the date? 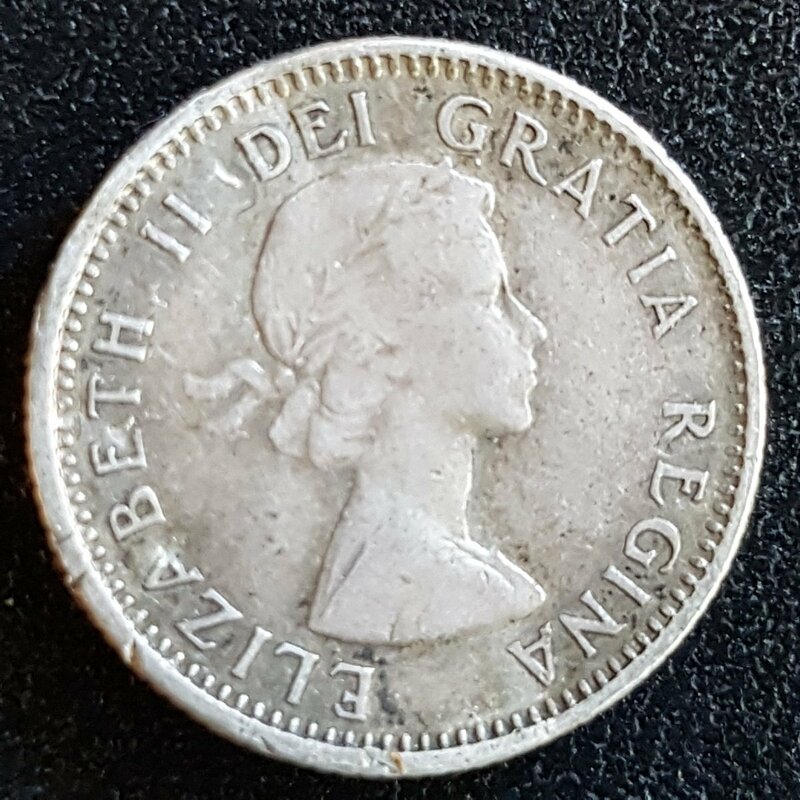 I do like the obverse with the retained laminations at 2 o'clock and 8 o'clock. there is also a good area unstruck showing the raw metal. 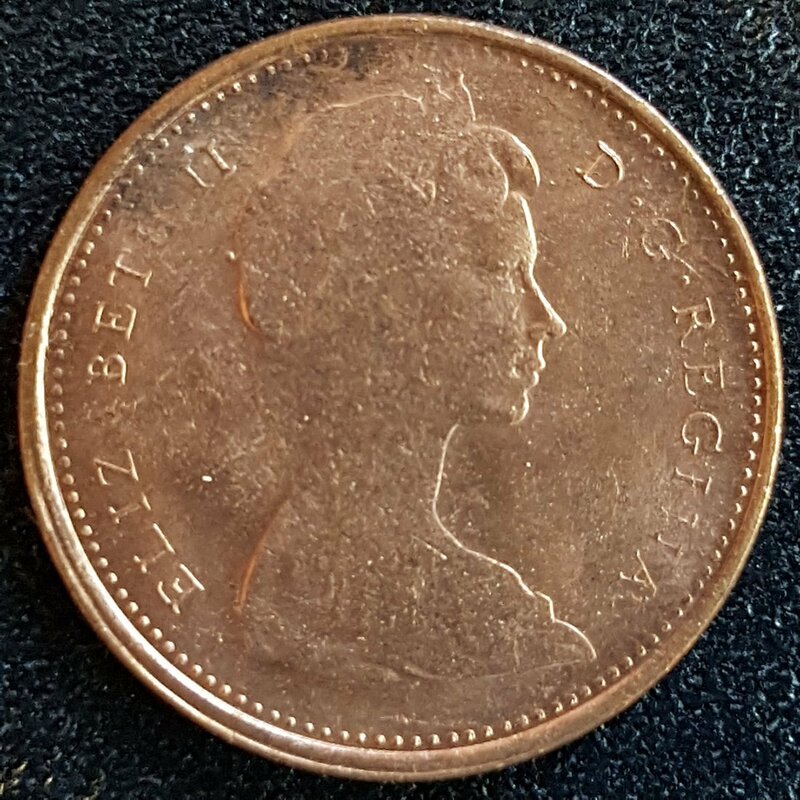 coin # 8 is from 1977 and weighs 1.43 gr which is 44% of the weight of a typical 1977 1 cent. 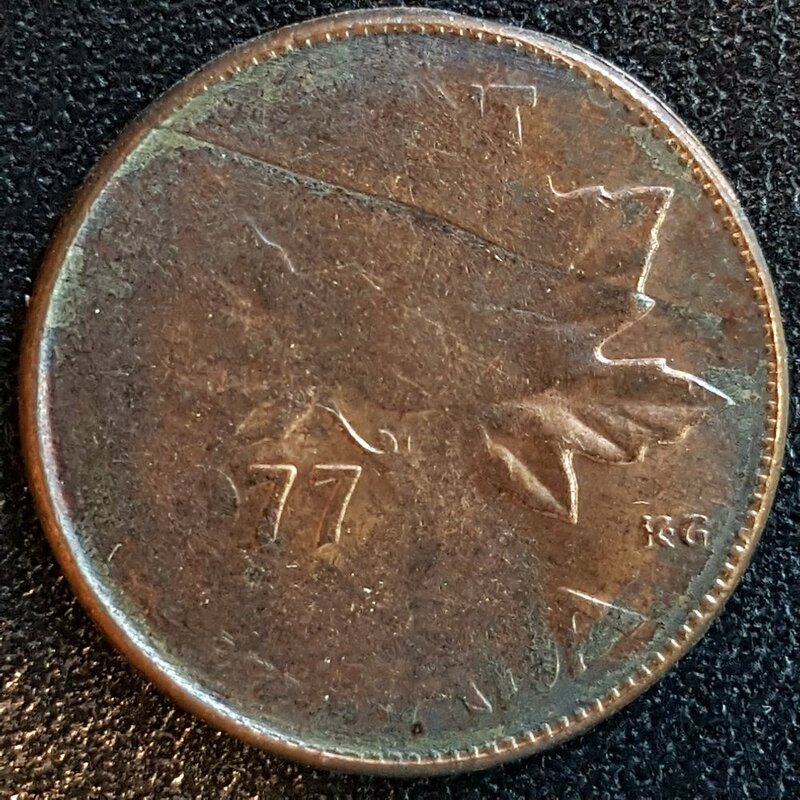 it was nice of the coin to have such a strong 77 for identification. 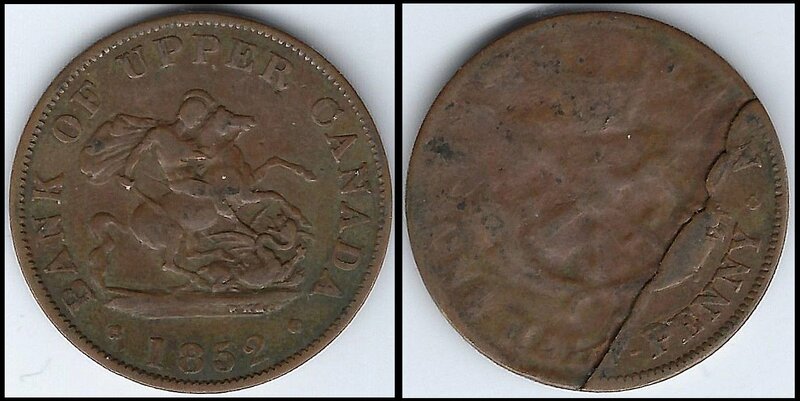 there is a visible ridge across the reverse and a strong strike on one side of the coin. there is even some extra metal along the rim on the strong side, a bit of a flattened rim fin from the extra pressure on the side with more metal. 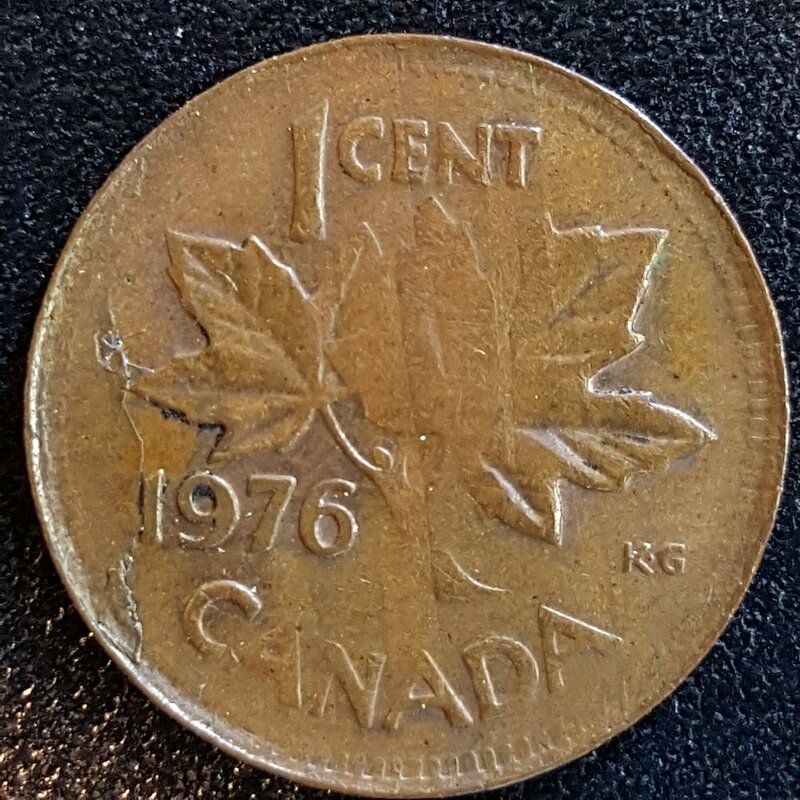 coin # 9 is from 1972 and weighs 1.96 gr which is 60% of the weight of a typical 1972 1 cent. 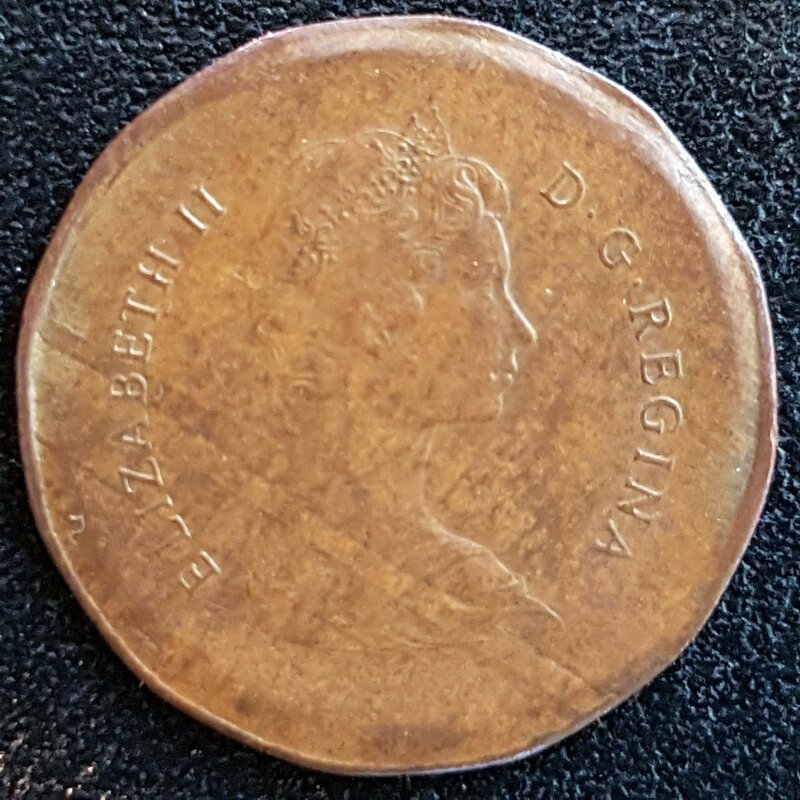 there is a reminent of a lamination through the date and to the rim, a strong strike in a small area at the bottom, and a nasty scratch across the bust. 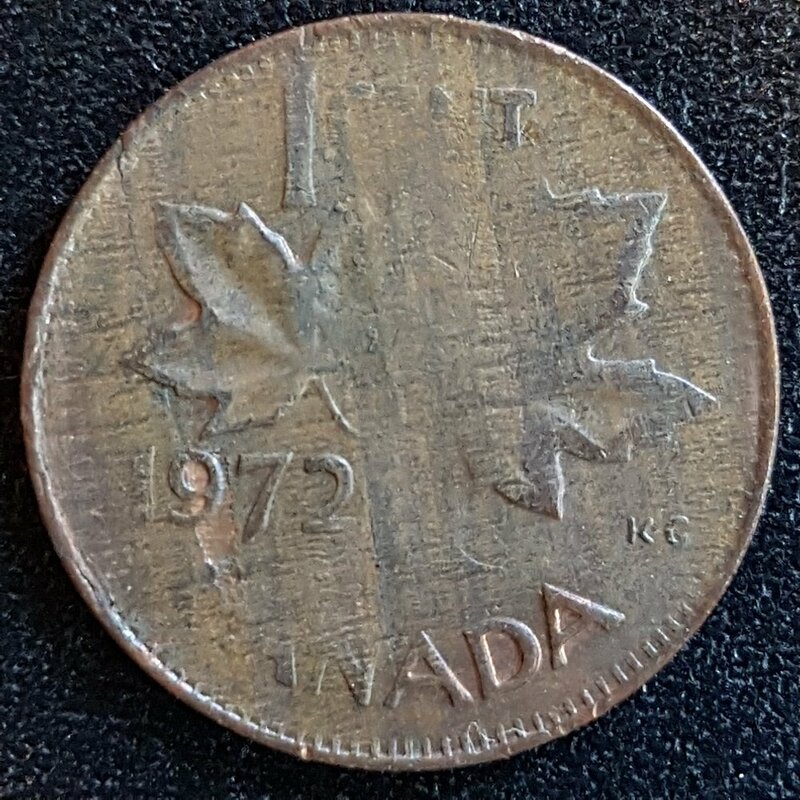 coin # 10 is from 1976 and it weighs 1.95 gr which is 60% of the weight of a typical 1976 1 cent. with 60%, the strike is stronger. there is a retained lamination near the date and visible striations across the reverse. 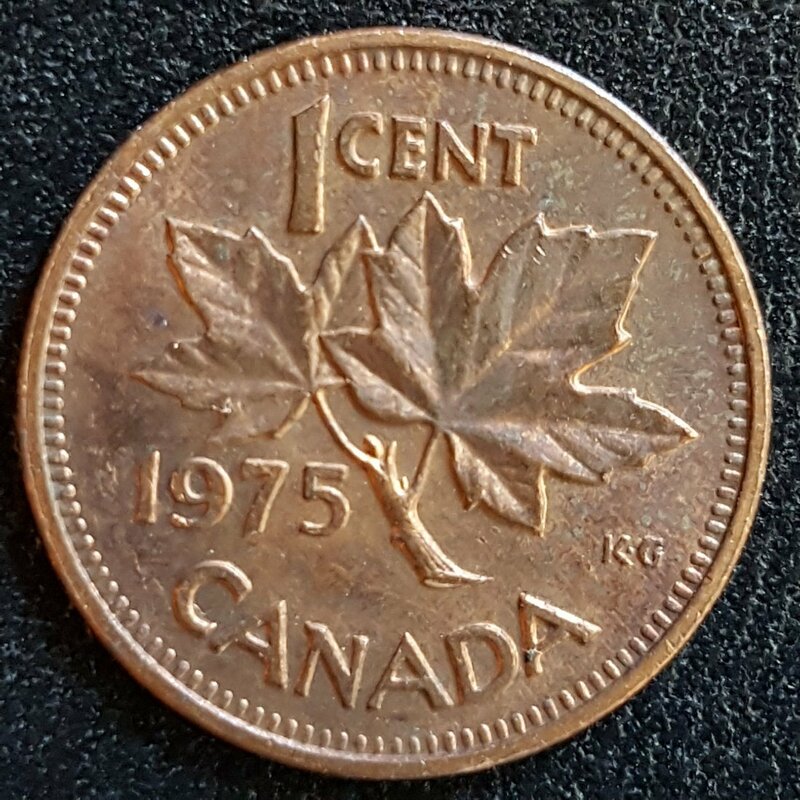 coin # 11 is from 1974 and weighs 1.97 gr which is 61% of the weight of a typical 1974 1 cent. 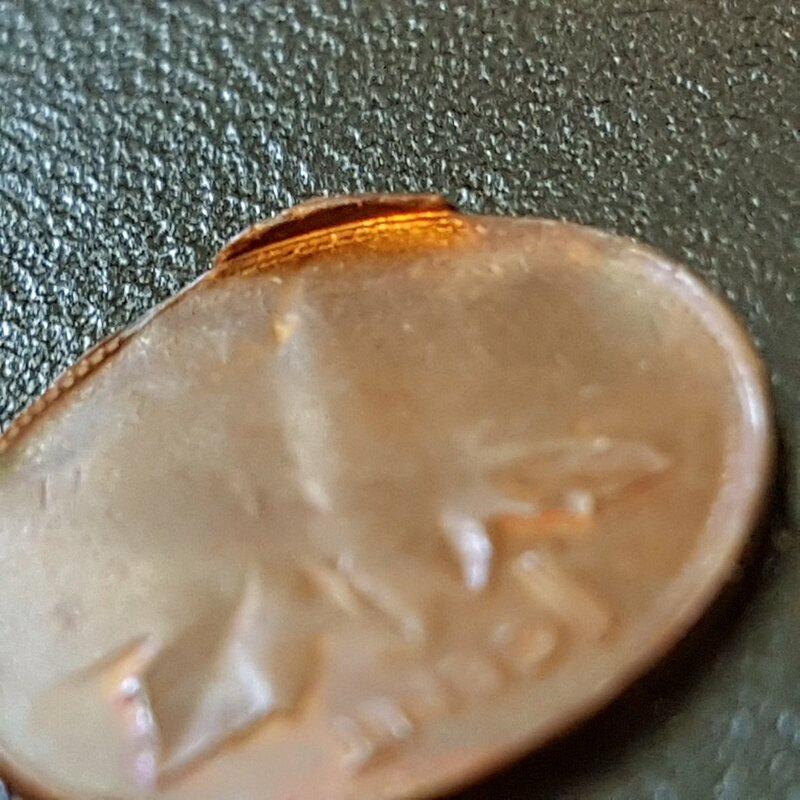 this coin has a reasonably strong strike all around the edge but weak in the center. this one has nice eye appeal and a strong date. 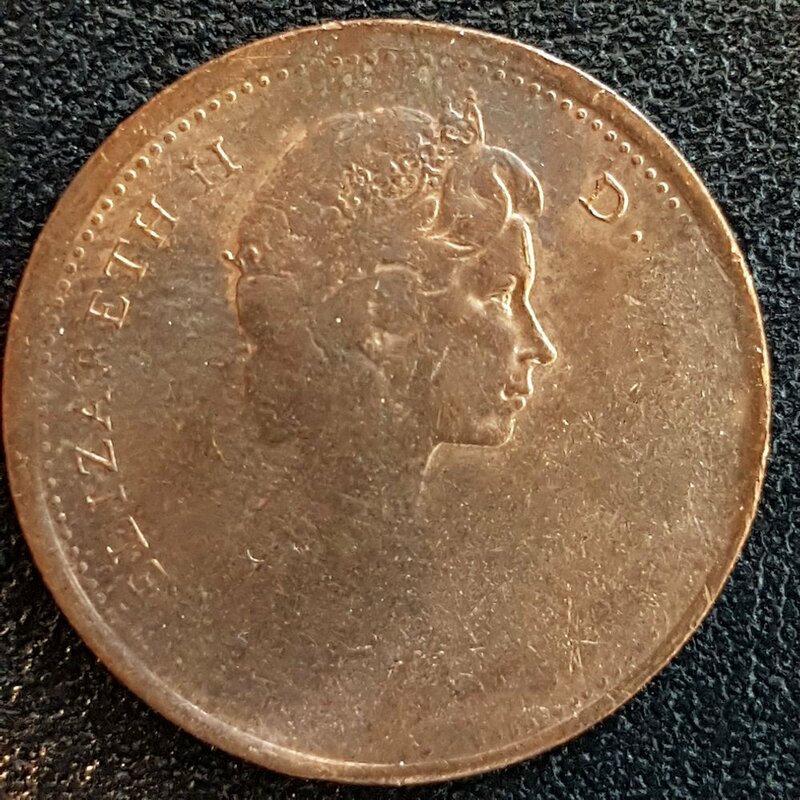 coin # 12 is from 1975 and weighs 1.24 gr which is 38% of the weight of a typical 1975 1 cent. I really like this one with the big "ragged clip" like area. this really shows again how haphazard these splits can be. the reverse strike is extremely weak with only 38% of the original planchet available to strike. nice to see the date though! there is a bend at the top which is likely post strike damage. the next category is 'split after strike'. a full planchet enters the striking chamber and a coin is fully struck and then it splits into 2 pieces, each with a full strike on one side and and a uniface on the other. I would assume that in most cases, the pressure of the strike causes the split. I have always had the next 4 coins categorized as "split after strike" because of the strong and normal strike on one side and the uniface on the other. but after further research and a lot of pondering, I believe now that the first 3 are actually 'uniface strikes on split planchets'. 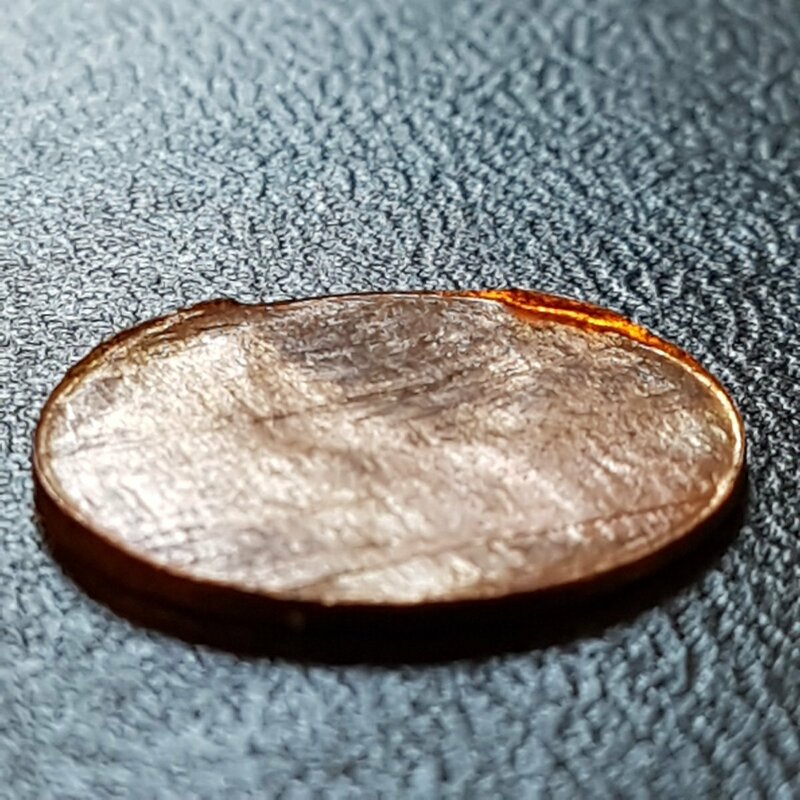 coins 1 through 3 have a very smooth look and feel with little to no striations that should be present in a split planchet. coin number 4 has these striations and so does the blank split planchet that follows. 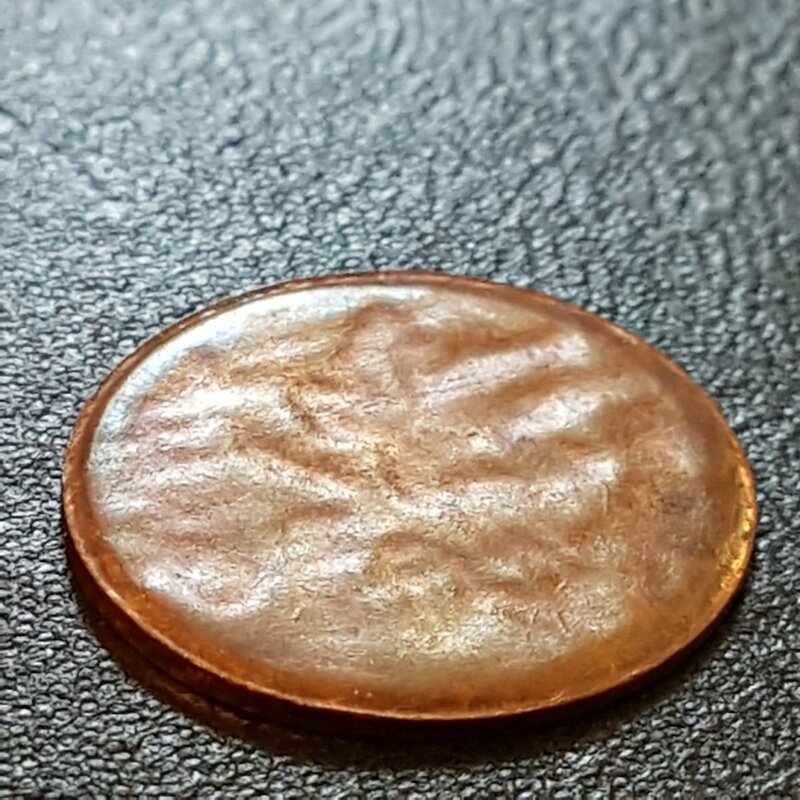 so I believe that these first 3 entered the chamber along with a normal planchet which obliterated the striations with the extra metal in the chamber. all 3 also show rim fins (extra metal) all around the rim caused by the increased metal in the strike chamber. 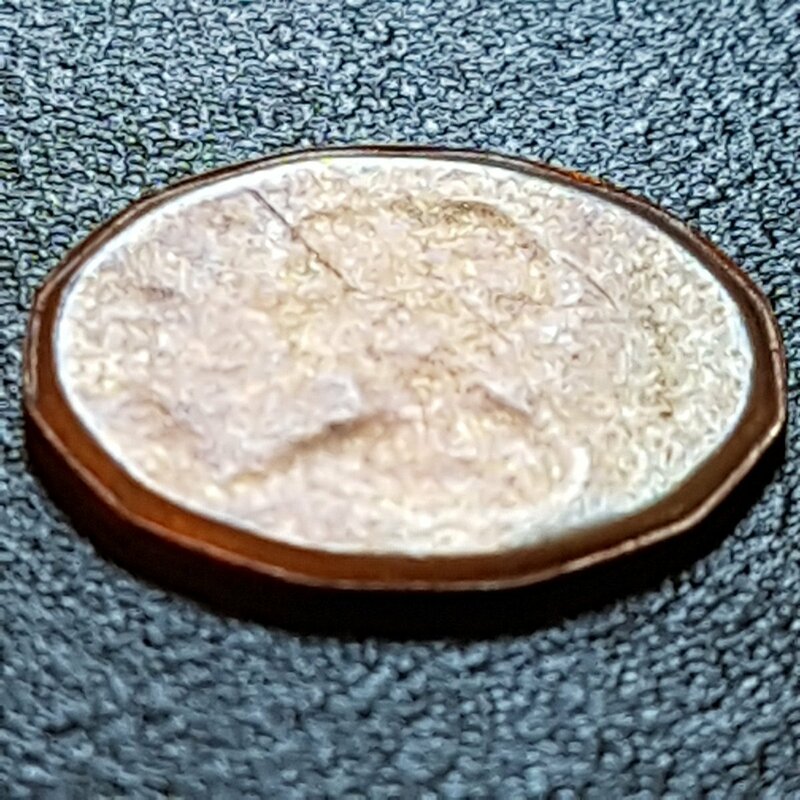 -Unifaced - Result of a coin struck through a blank planchet, that may or not have capped the top die. 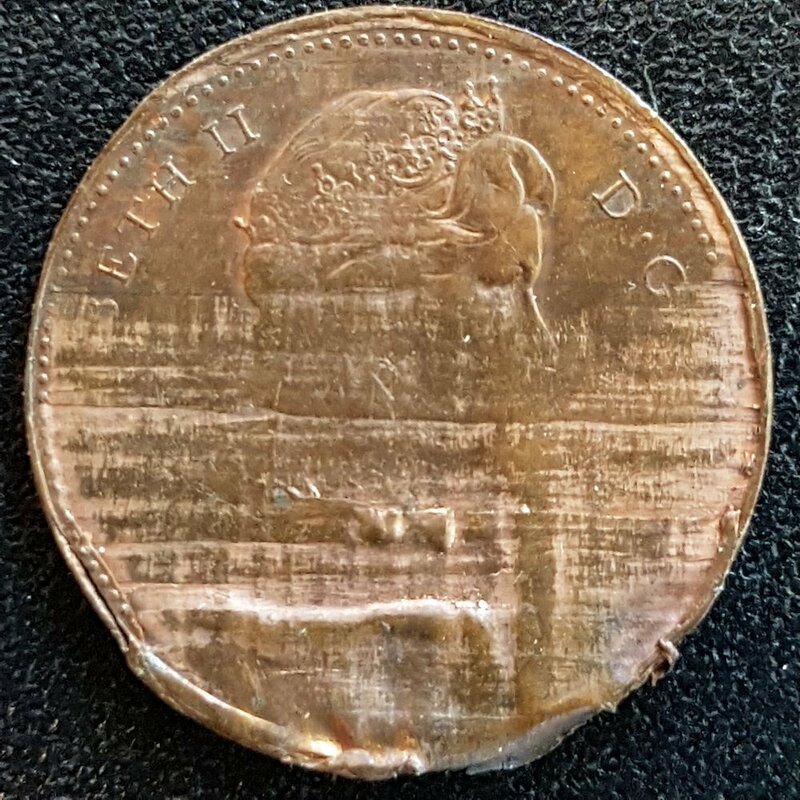 Split or Rolled thin planchets are sometimes fed to dies with another proper planchet and struck also creating this effect. why do I think this is important to determine if these next 3 are a uniface strike? because they would have split before striking, but resemble a split after strike coin. plus you have added a brockage to the split planchet, so 2 errors in one! 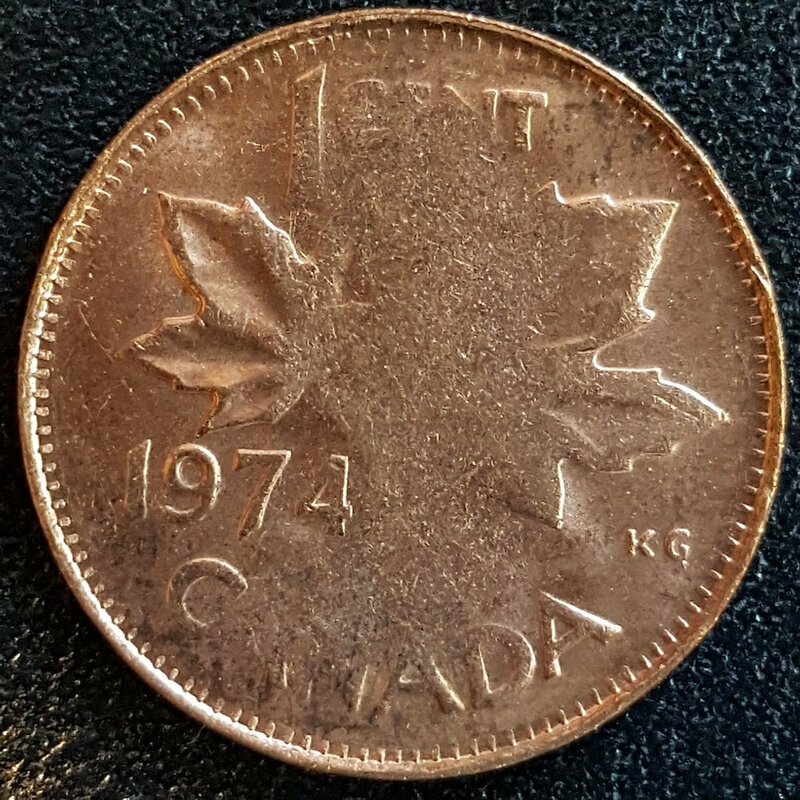 coin # 1 is from 1975 and weighs 1.47 gr which is 45% of the weight of a typical 1975 1 cent. a strong and normal strike on the reverse with some evidence of rim fins. 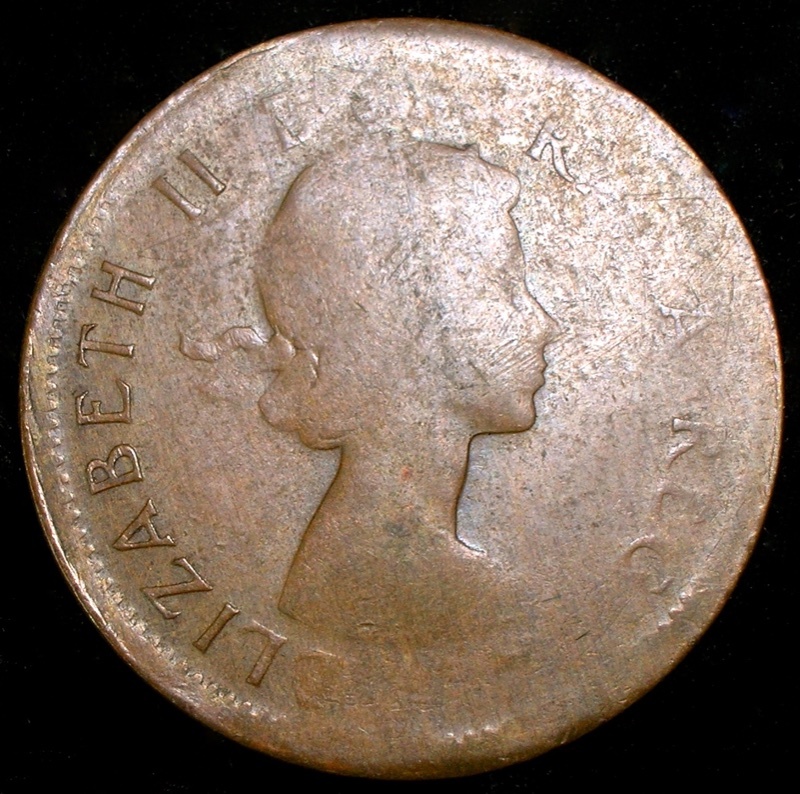 the obverse is uniface with a ghost image of the reverse visible through the thin planchet. even though some striations seem to be visible, the surface is smooth and the striations are not detectable through touch. 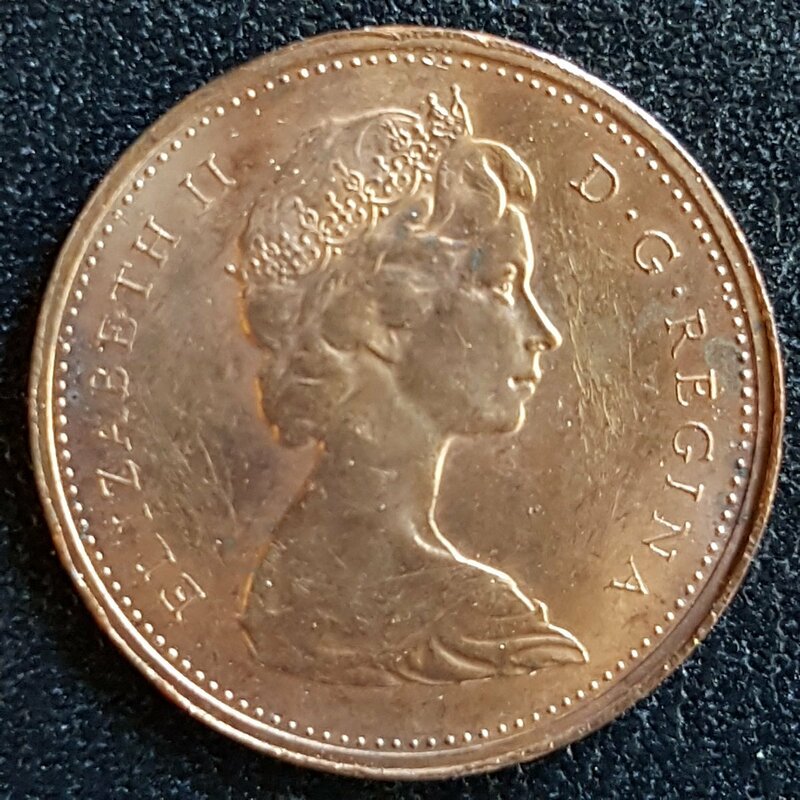 coin # 2 is from 1981 and weighs 1.45 gr which is 52% of the weight of a typical 1981 1 cent. this one has the visible striations on the struck side which gives it a woody look. 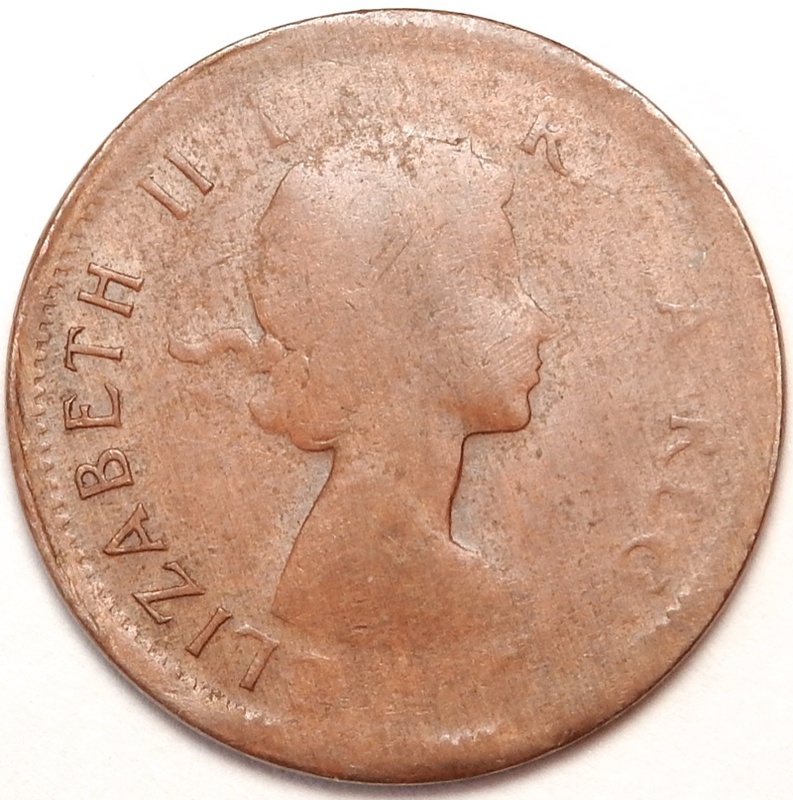 the obverse uniface has no evidence of any kind of striations which leads me to believe that the uniface side was originally the outside of the split planchet. 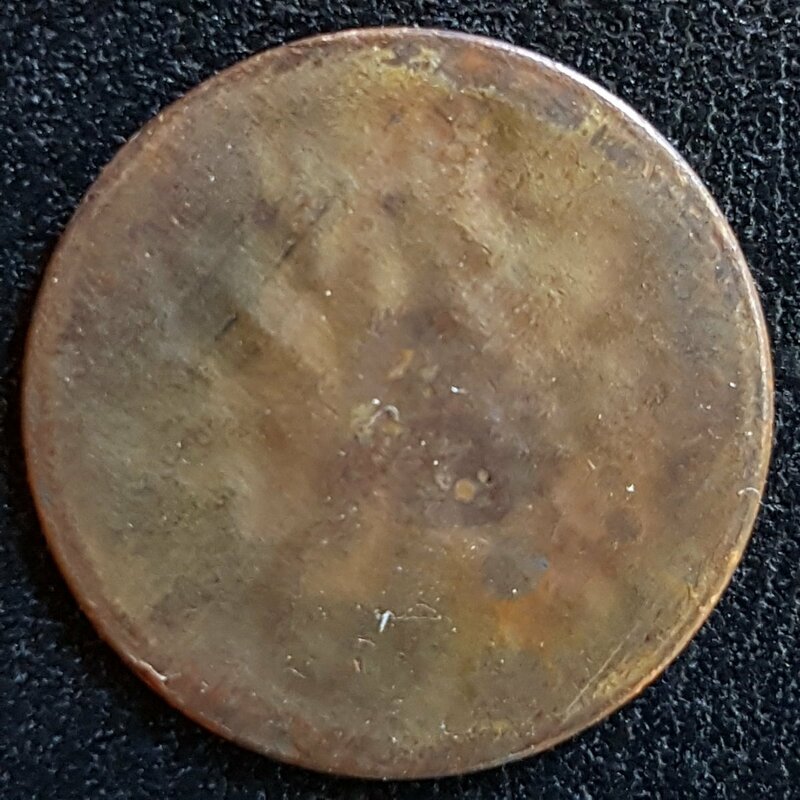 this leads me to reason that coin #1's uniface was the inside of the split planchet due to the visible striations. 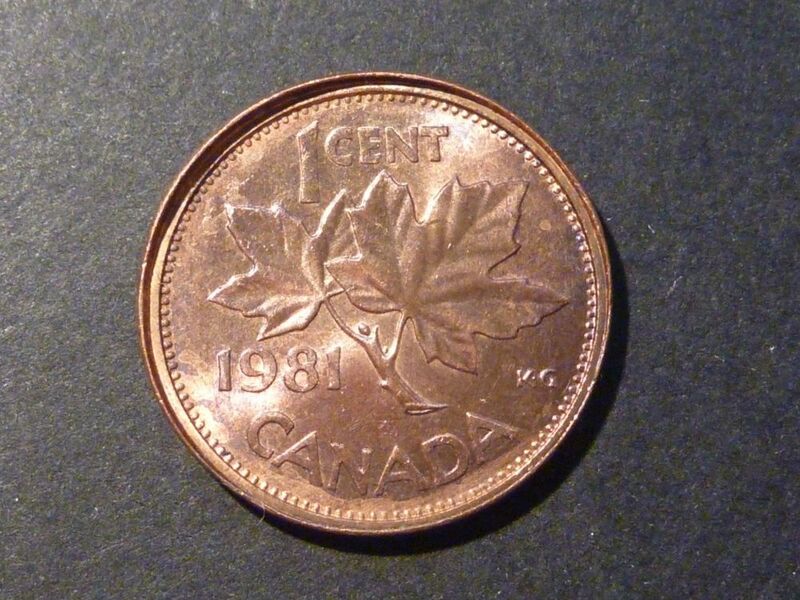 coin # 3 is from 1982 to 1989 and weighs 1.22 gr which is 49% of the weight of a typical 1982-89 1 cent. 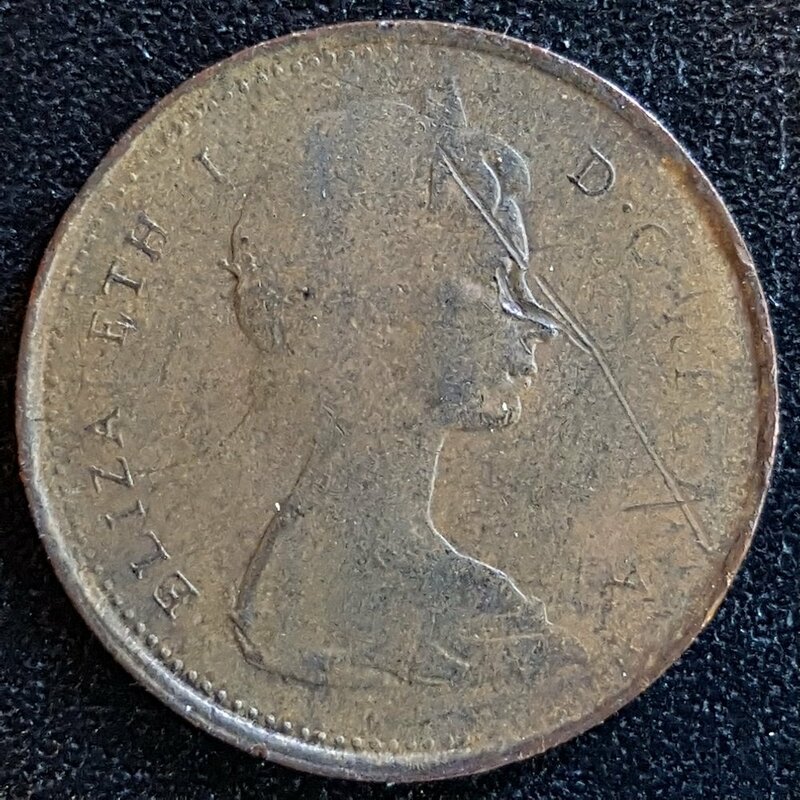 this coin also has slightly visible striations on the uniface side which is the reverse in this case. 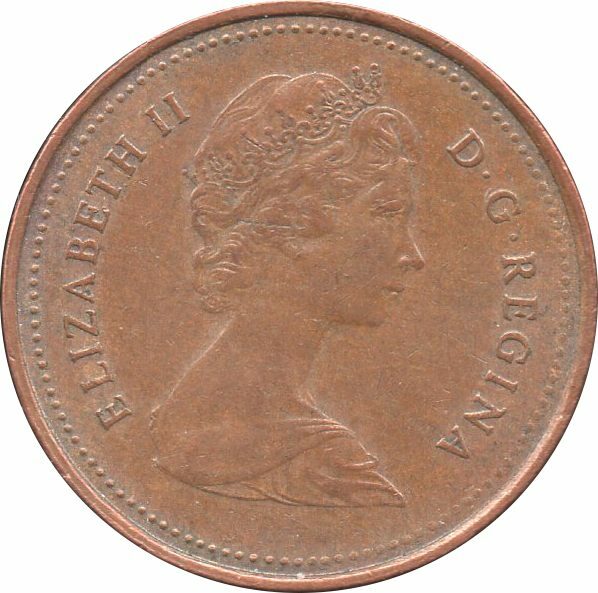 coin # 4 is from 1965 to 1978 and weighs 1.50 gr which is 46 % of the weight of a typical 1965 to 1978 1 cent. 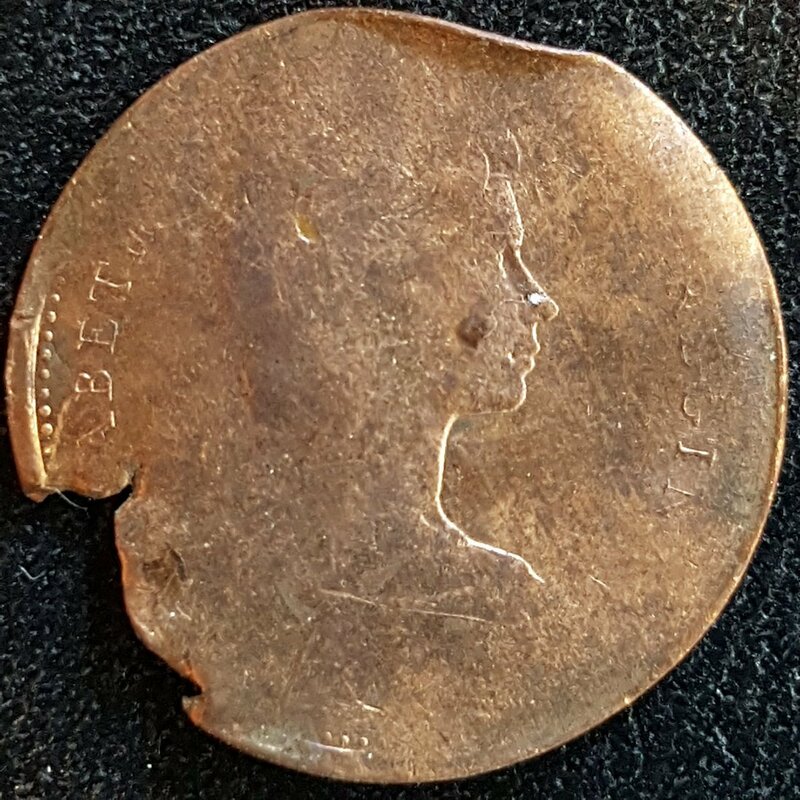 now this one does have the expected heavy striations of a split planchet on the reverse of this coin. you can see the striations clearly and feel them as well unlike the other 3 uniface. 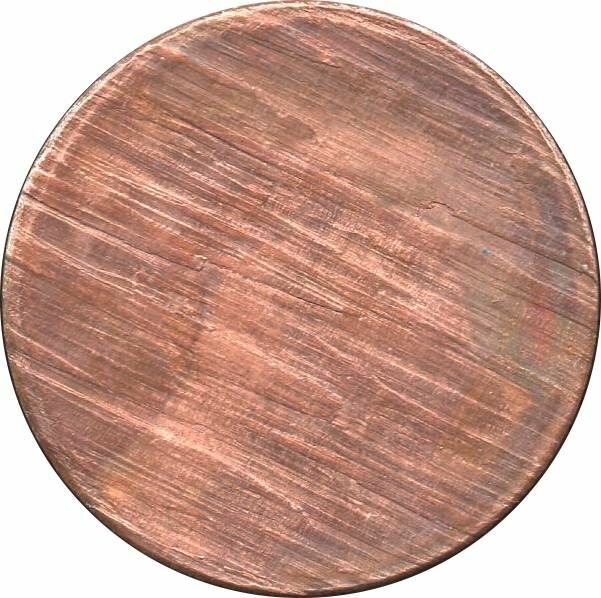 blank split planchet. 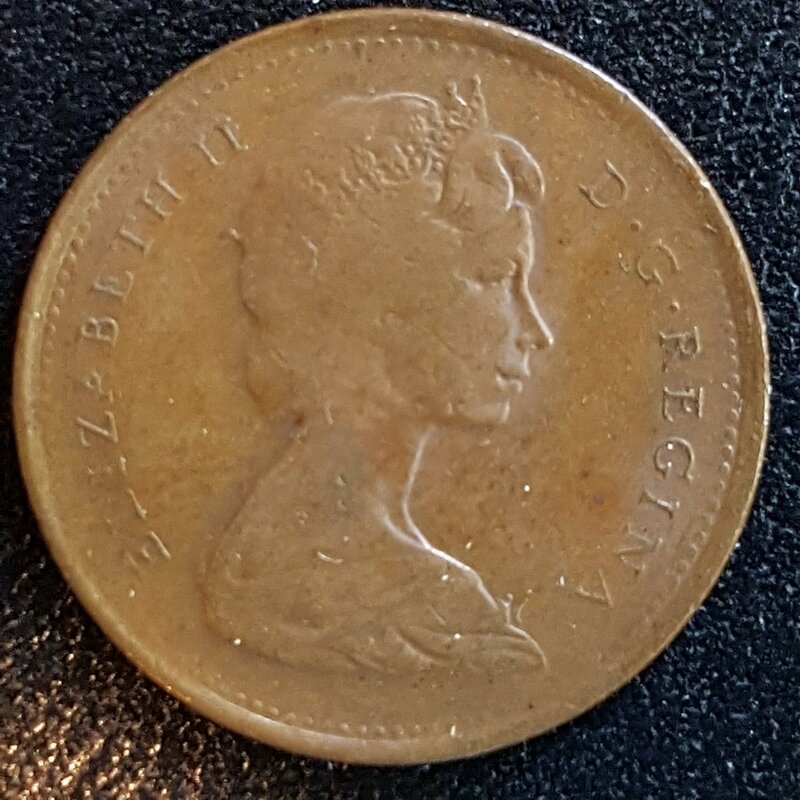 it weighs 1.32 gr and could be from any country but we will assume it is a Canadian 1 cent planchet because it was purchased in Canada as a Canadian coin. 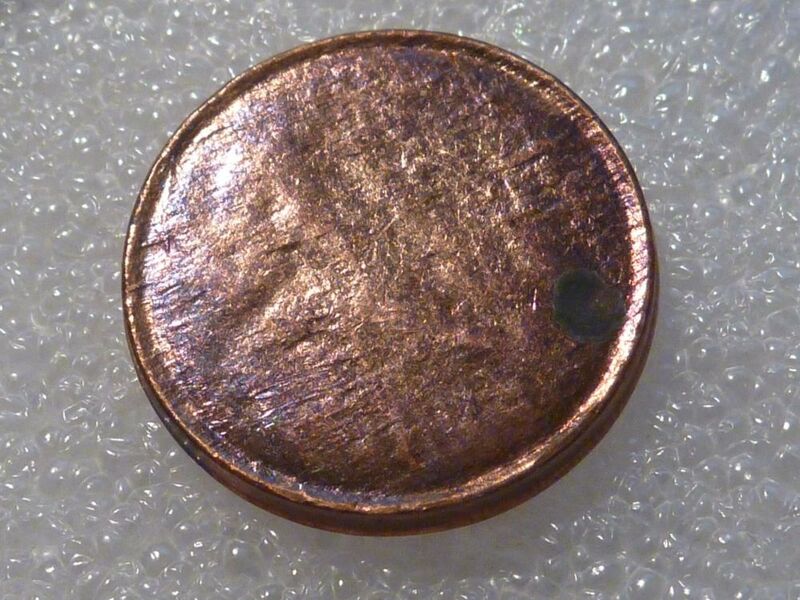 its relevance is as an example of a split planchet unstruck for studying purposes and to further advance a set. 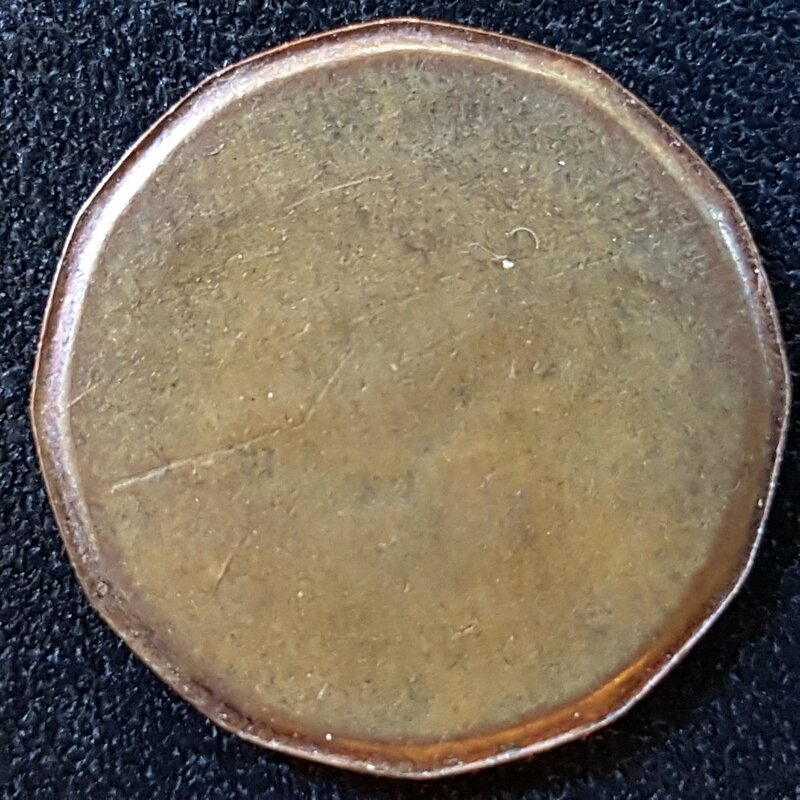 this blank shows very clearly what a split planchet looks like on both sides:smooth on the outside and heavy striations on the inside of the split. 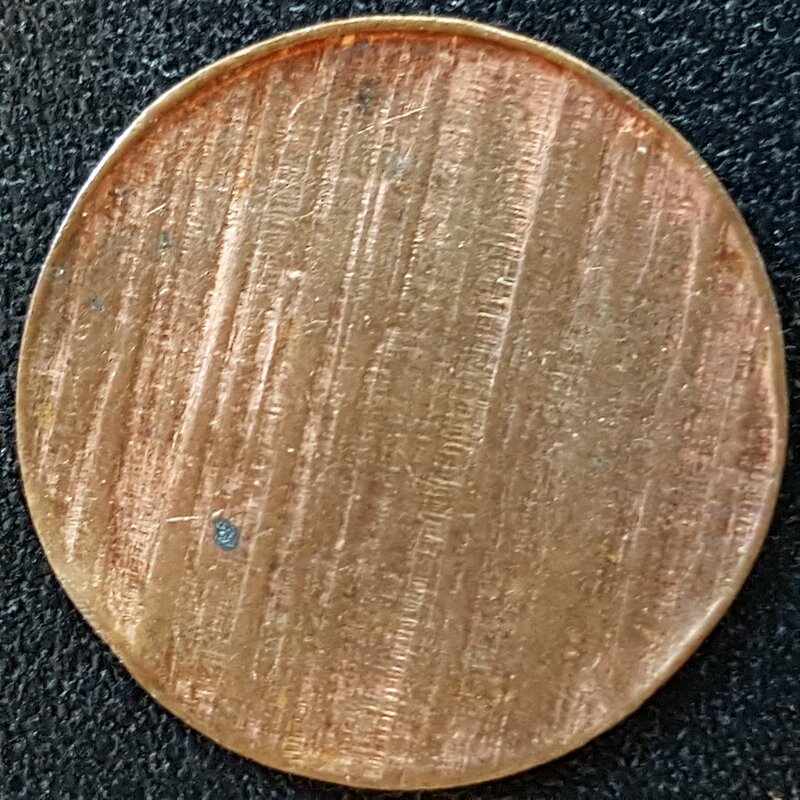 partial split planchet. 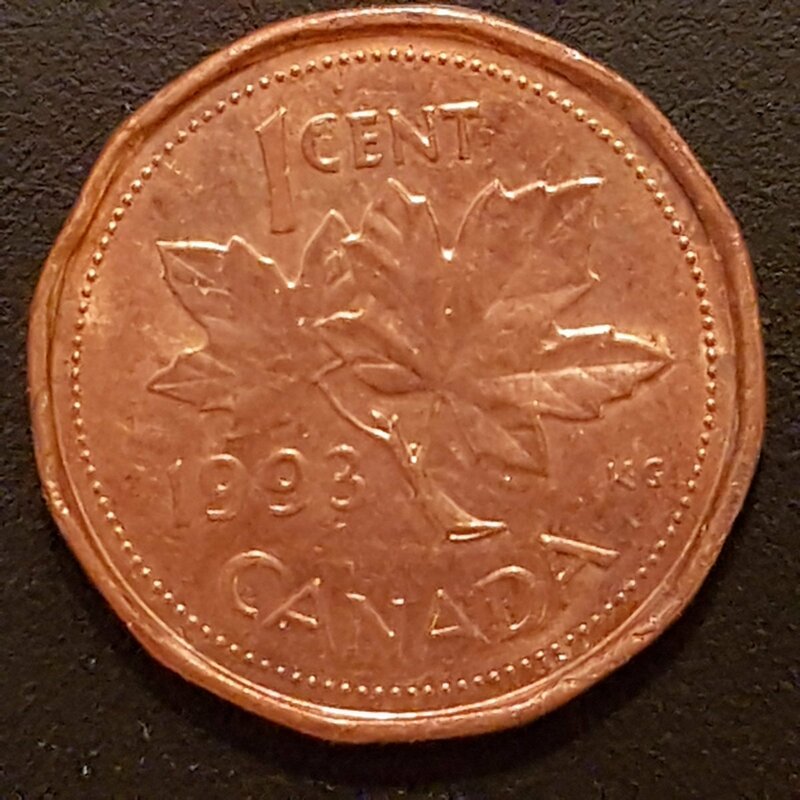 this coin is from 1993 and weighs 2.33 gr which is 93% of the weight of a normal 1993 1 cent. 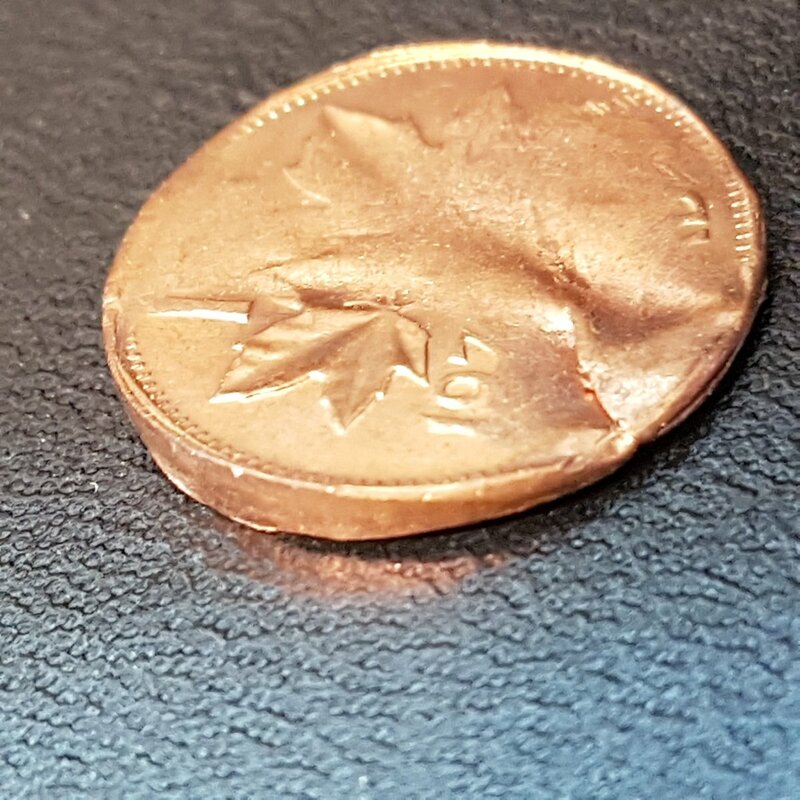 the part that split off was very thin and only 7 % of the total weight of a normal planchet. this obviously split after strike and shows the heavy striations of what a split looks like inside. if this was split before strike, there would have been a weak strike on the reverse directly opposite of this split. if the delaminated piece was still attached, this would be a clamshell split. clamshell split planchet. 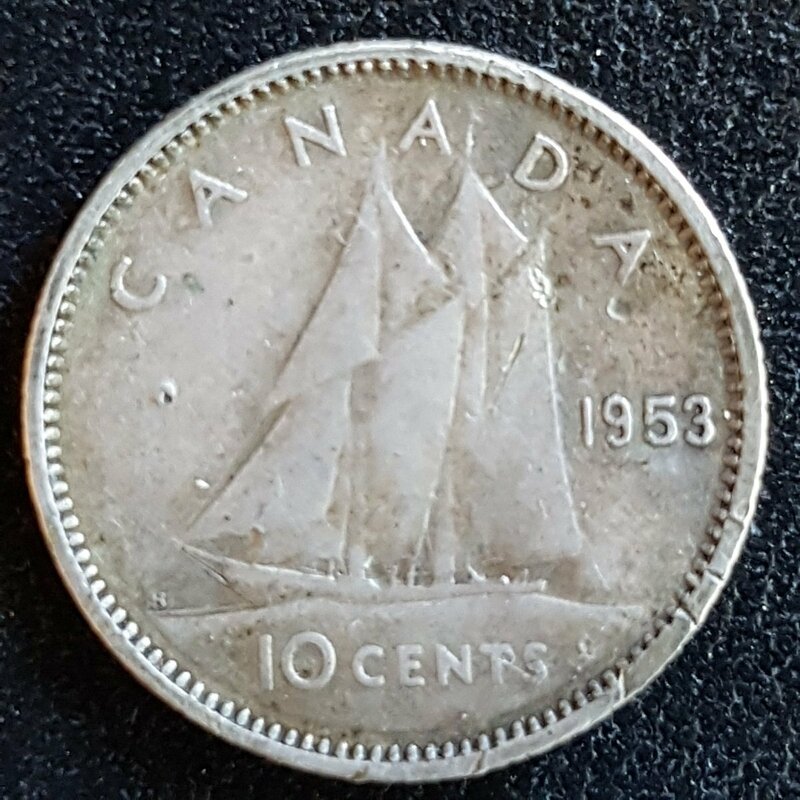 1953 10 cent silver. normal weight. before I owned it, someone pryed it open a bit hence the bend at the hinge point. I hope you all enjoyed reading this and checking out the different coins that fall under split planchets. I welcome any comments especially regarding the uniface strikes. also keep in mind that I am not an expert, I am an enthusiast and still learning. feel free to tear apart my uniface theory! What a great, informative post. Thanks! Folks should copy and save this as a visual reference. A very nice presentation robmck1967 ! Well done! thank you Okiecoiner and Darryldarryl. I should mention that everyone is encouraged to post their own split planchets in this post. that will make it a great reference point for all. even US or other countries split planchets are welcome to be posted here. 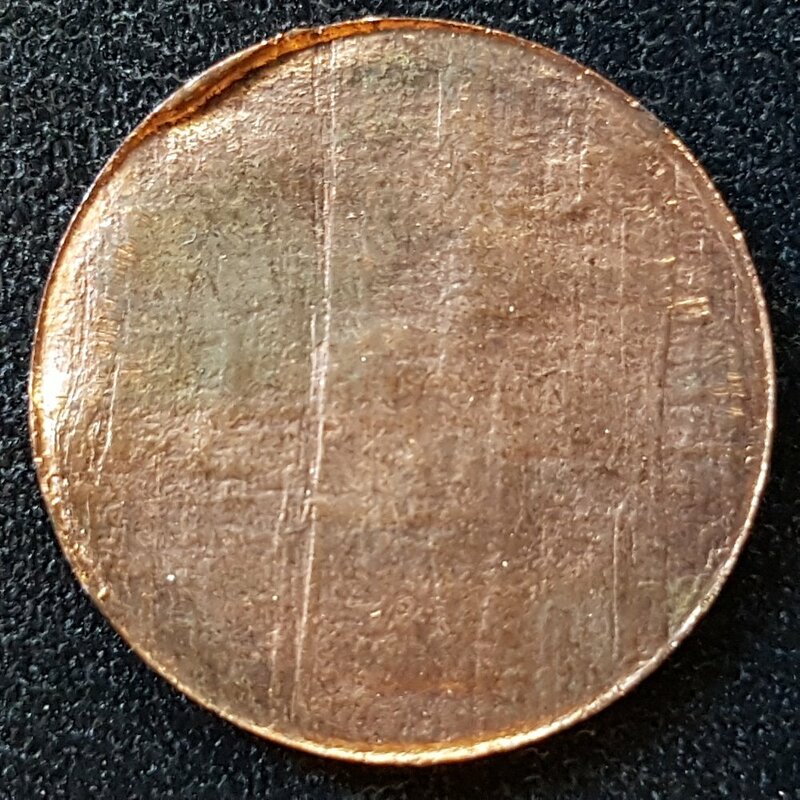 How do you know the planchet was split prior to the strike, and not just a thin planchet (which you can get at the end of the strips that are rolled for punching out the blanks)? 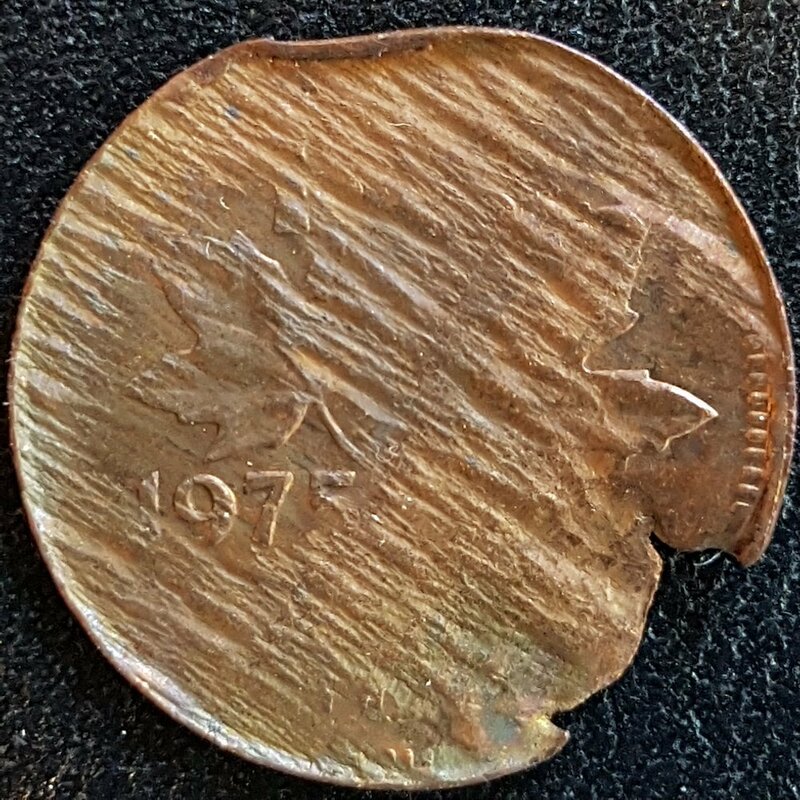 Here is a planchet split after the strike. This one is normal weight, but it was struck through a split planchet sitting on the anvil die. That's a nice collection you have put together robmck1967. Even though I am not an error collector, I appreciate when someone enthusiastically shares what interests them. I always learn something from threads like yours. 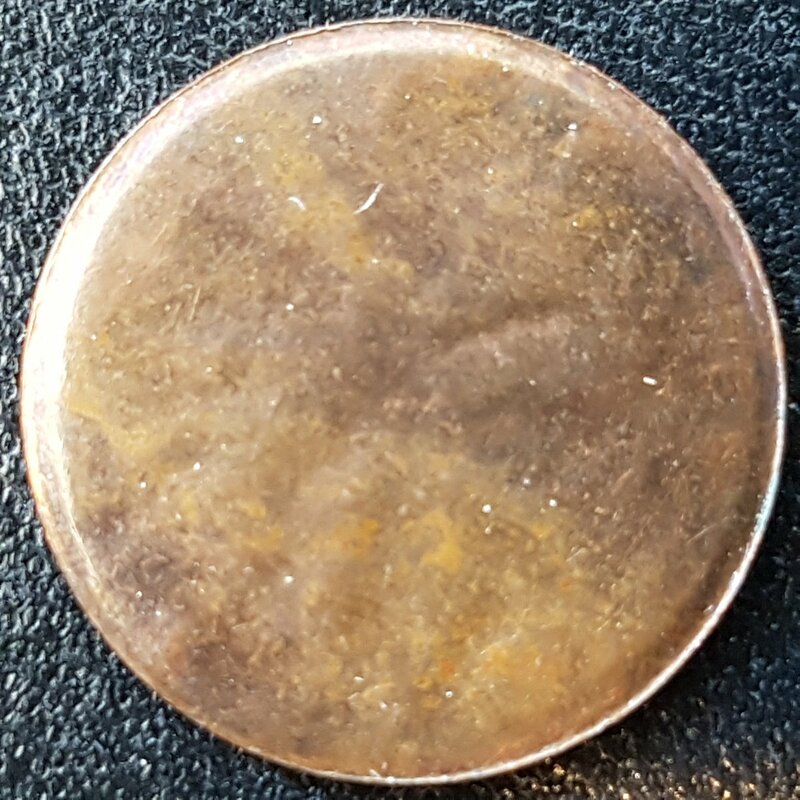 How do you know the planchet was split prior to the strike, and not just a thin planchet (which you can get at the end of the strips that are rolled for punching out the blanks)?" I have had these for years and have always had them listed as splits. I will take a closer look at them later. I assume the lack of striations has you questioning these? this is exactly why at the end of my post I mention that I am not an expert! lol. thanks SPP. as an update to my first 12 coins, coin 1 and 11 could very well be rolled thin planchets. 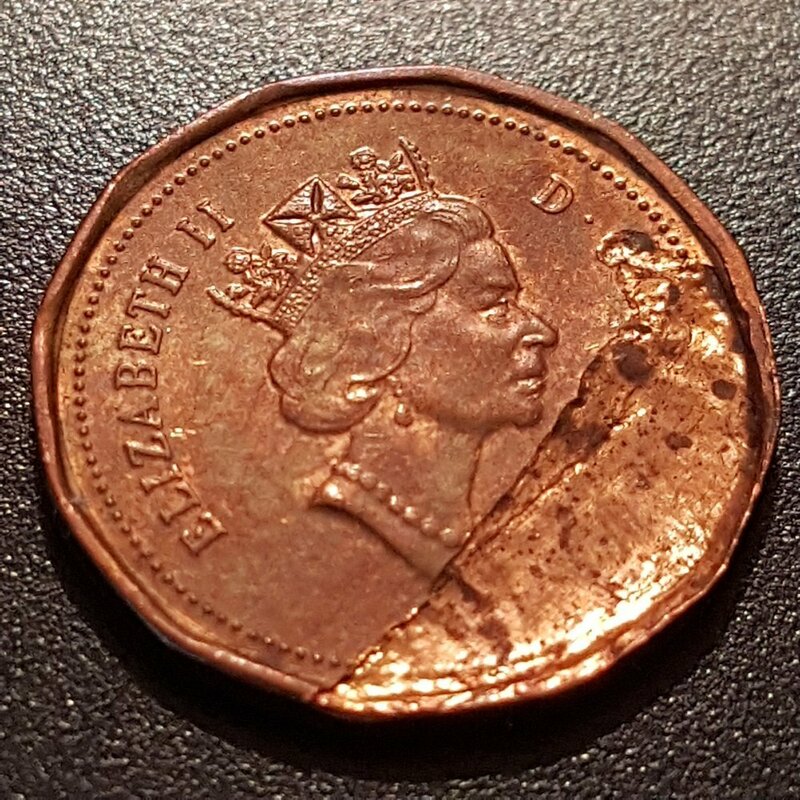 there are no visible striations on either side of the coin and if this was a split, there should be evidence on one side. coin # 3 does have some visible striations (but faint) on the obverse so I am calling it a split. at that point does a (de)lamination become a split planchet (or vice versa)? 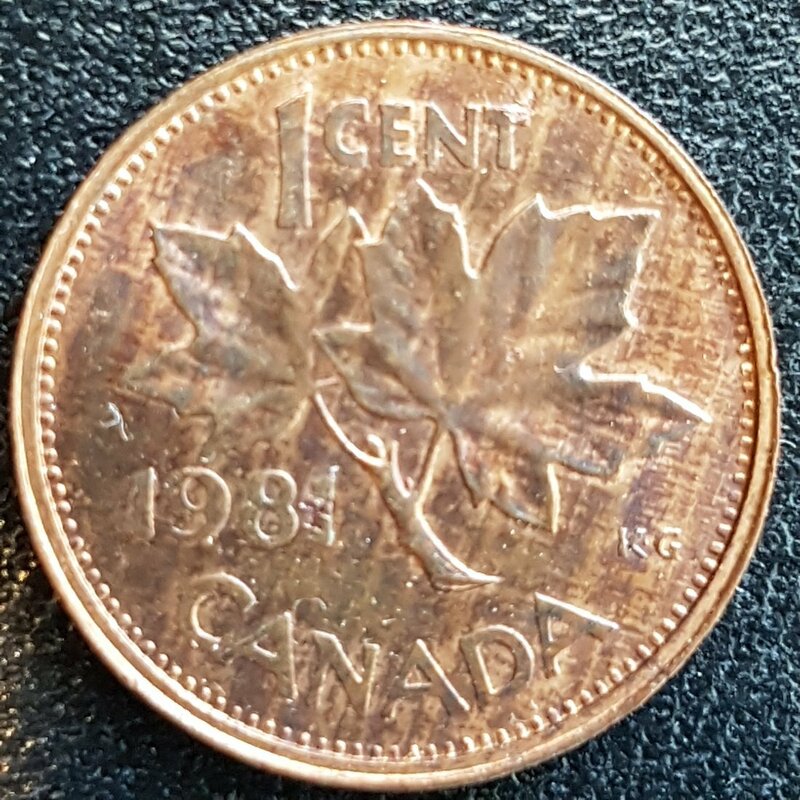 the 1993 cent is only missing a partial piece, would it not be considered a de-lam? wade said "at that point does a (de)lamination become a split planchet (or vice versa)? how would you classify this?" 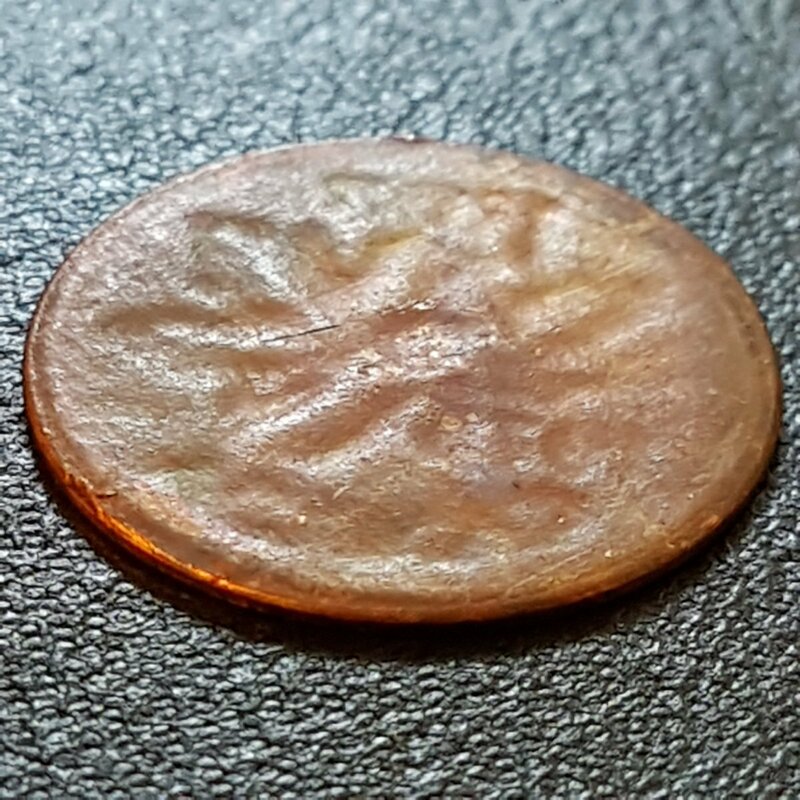 I only showed the partially split planchet (or delamination) because if the piece was retained it would be considered a clamshell split planchet. plus it is a good example for the discussion of split planchets. so your coin could be called a partially split planchet in my opinion. and how many split before strikes are actually a partial delamination? the strike could easily cover that such as my coin number 2. one side has a normal strike (the right side of the obverse and the left side of the reverse) so this coin would have been a partial split (before strike) similar to yours. the difference is yours split after strike. I was hoping some of you would post your split planchets here for further discussion. are they so scarce that only SPP and I have these? I doubt it so let's see some others up here! 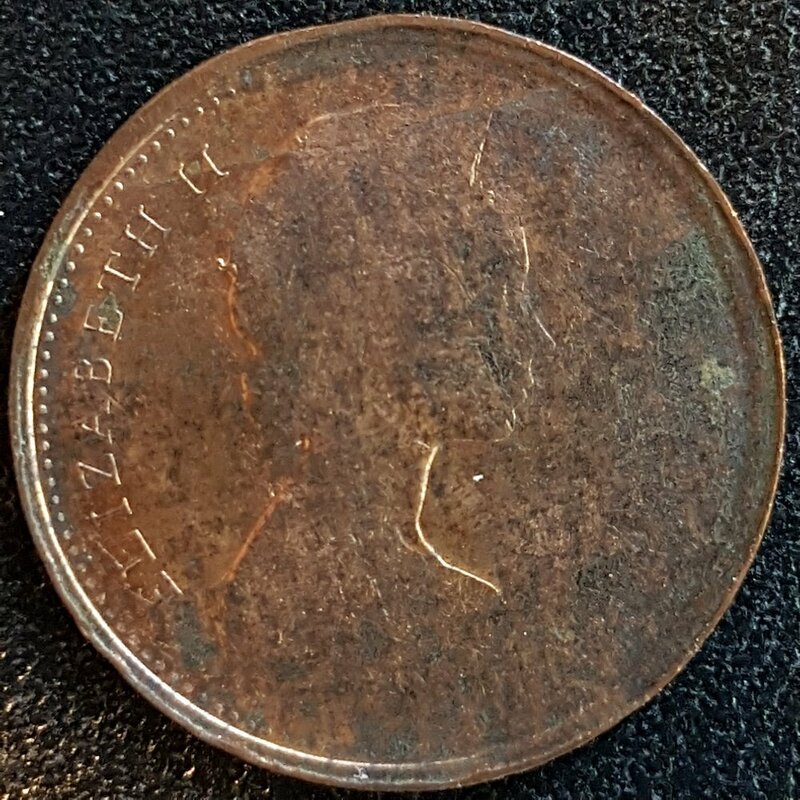 Here's the only one I own a 1959 one cent. The weight is 1.6 grams and it was under an ERF and came back CU - 97.84%, ZN - 1.58% and SN - 0.58%. I took two sets of pictures, the colour is closest to the second set of pictures when using the dark background. wow! beautiful coin Bill. 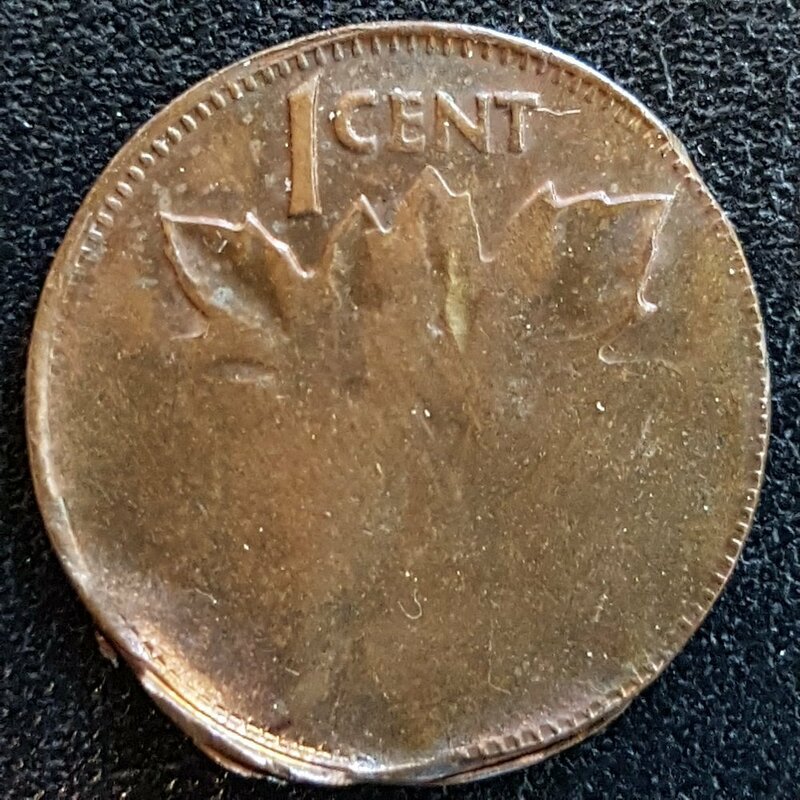 I haven't seen a split 1 cent from the 50's before. 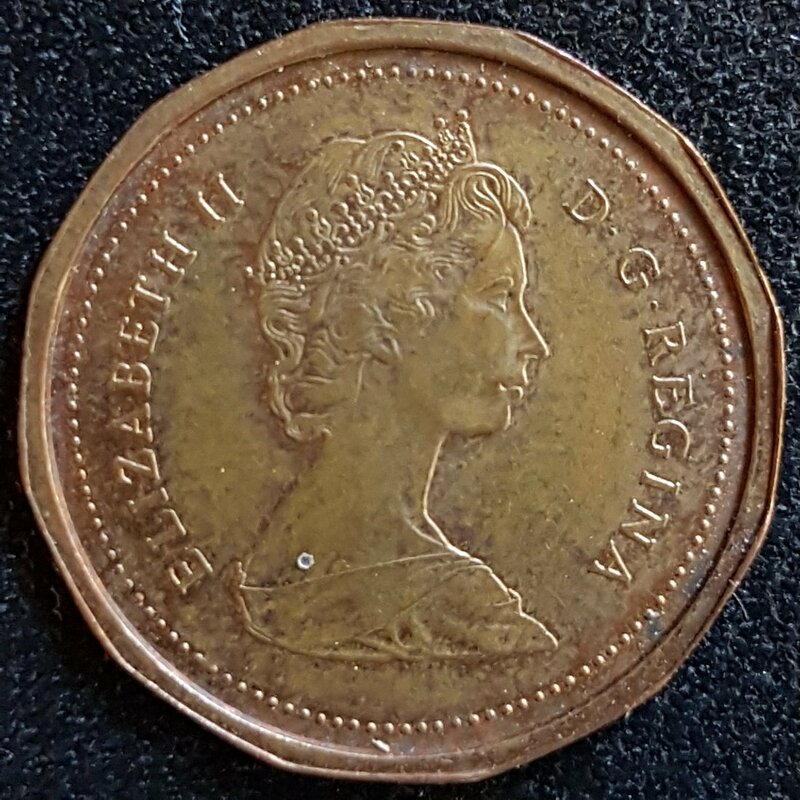 it has a fully formed rim on the reverse but not on the obverse.